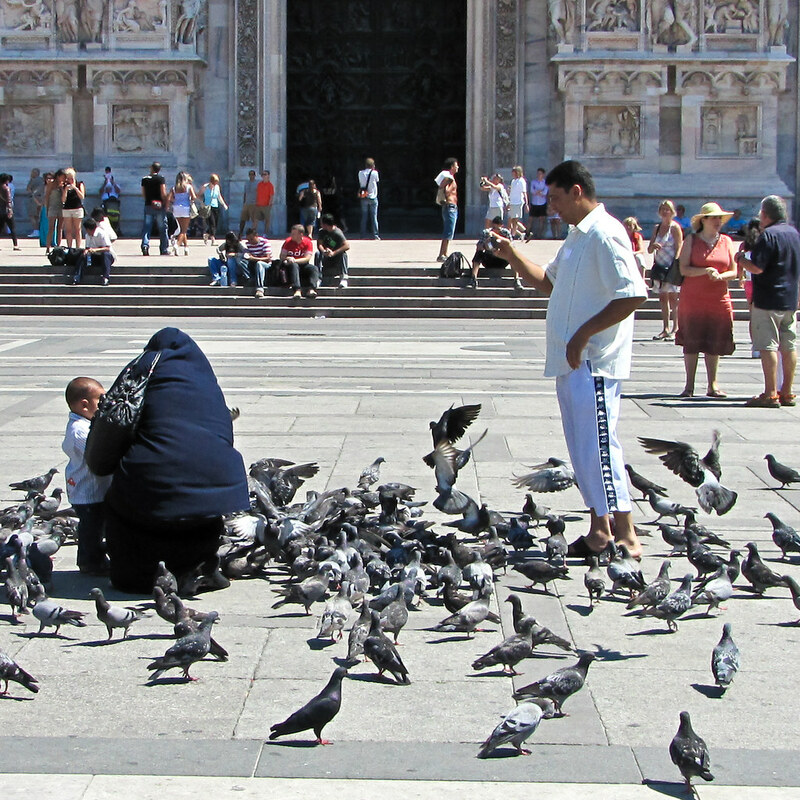 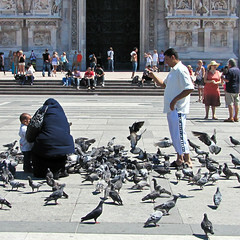 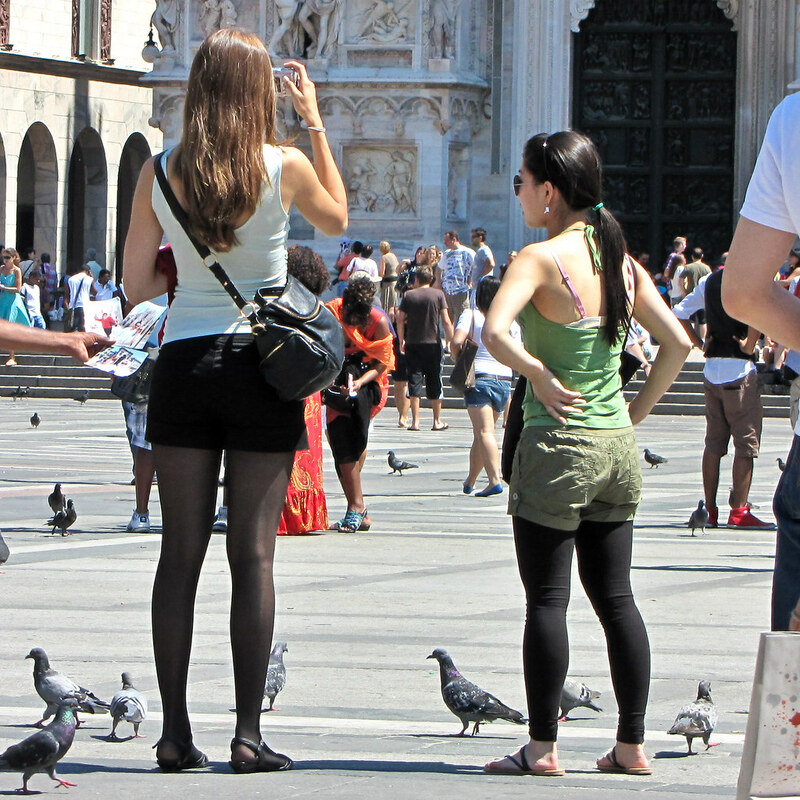 One of the most popular tourist attractions in Italy is Il Duomo and the square right in front of it, in Milan. 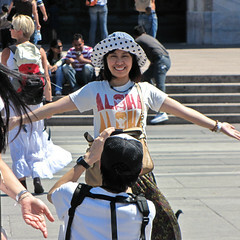 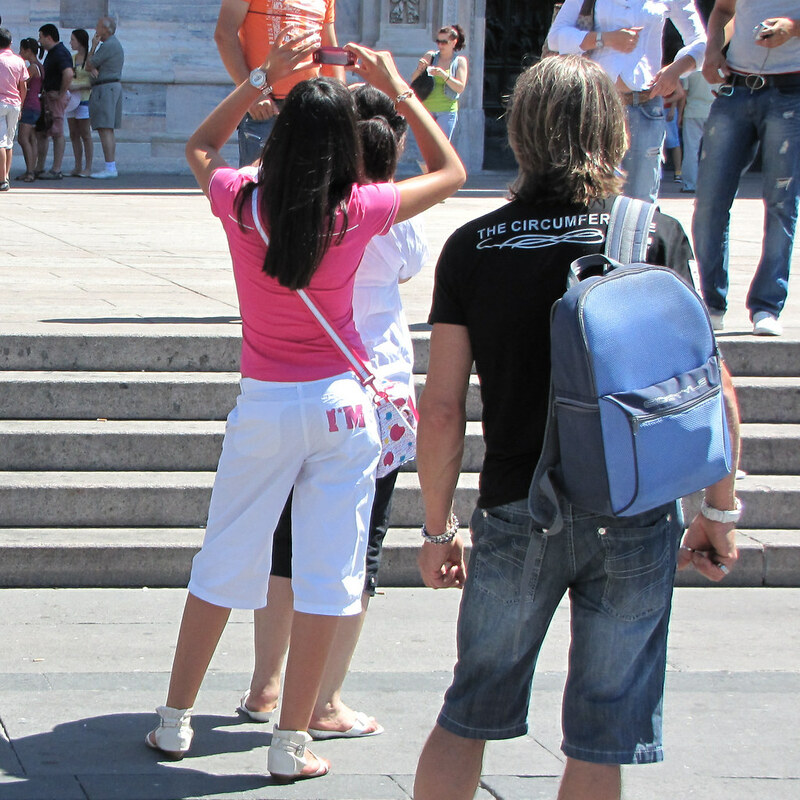 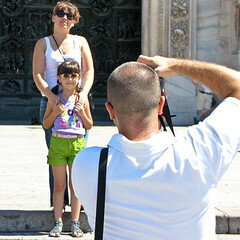 Tourists fall over each other to take pictures of the church’s facade as well as themselves on the square, with the church in the background. However, the sheer size of the edifice makes it rather hard to shoot a picture that’s both nice to look at while doing justice to the building itself. 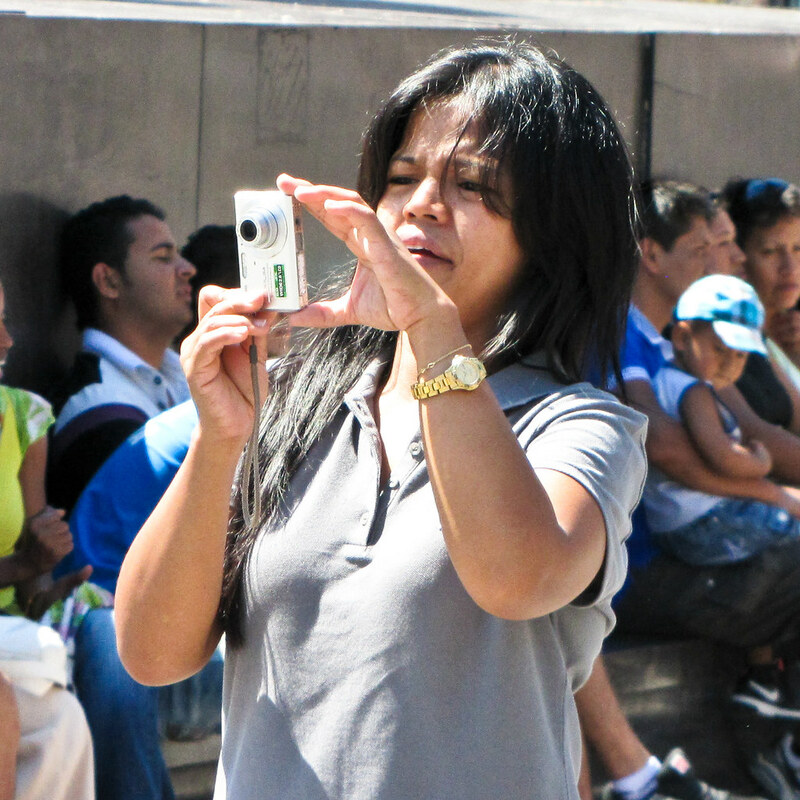 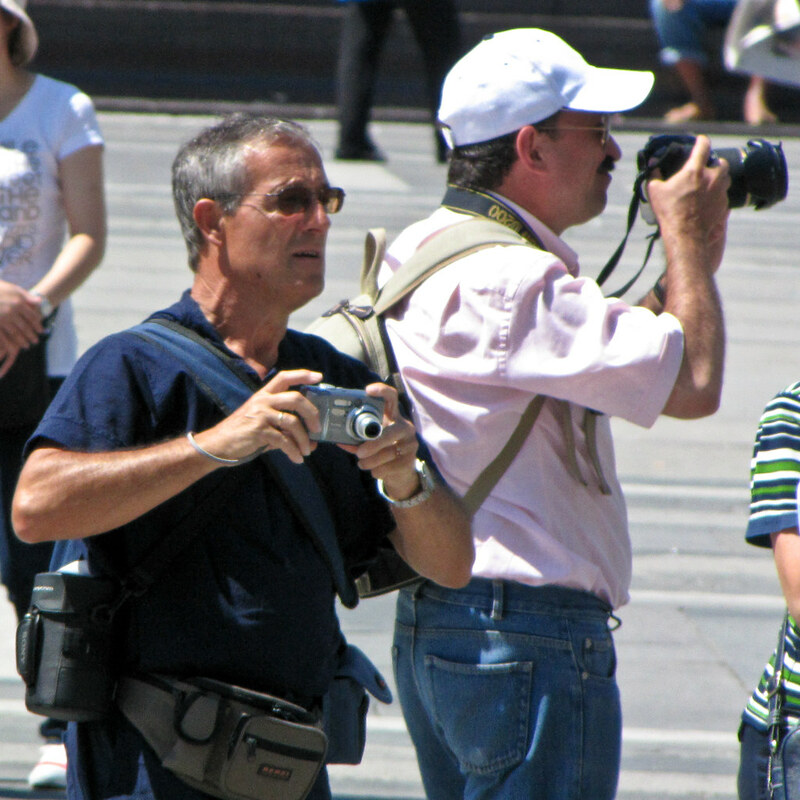 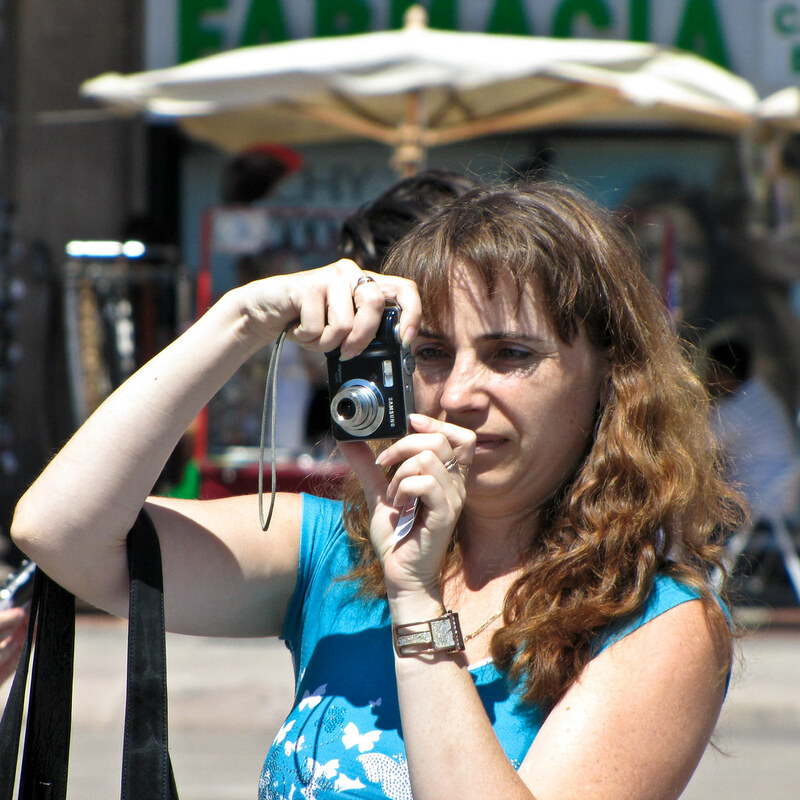 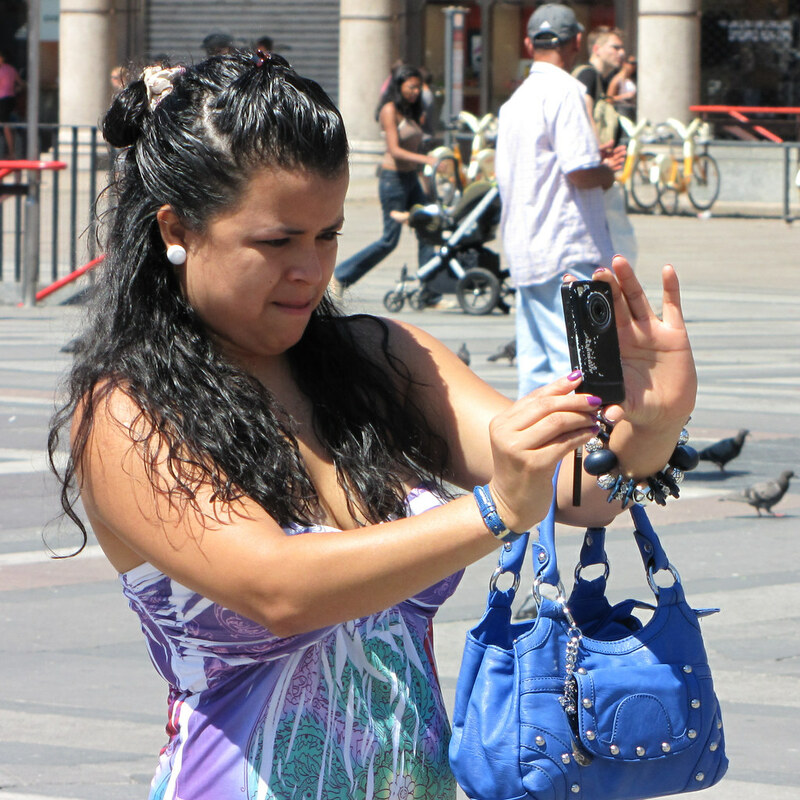 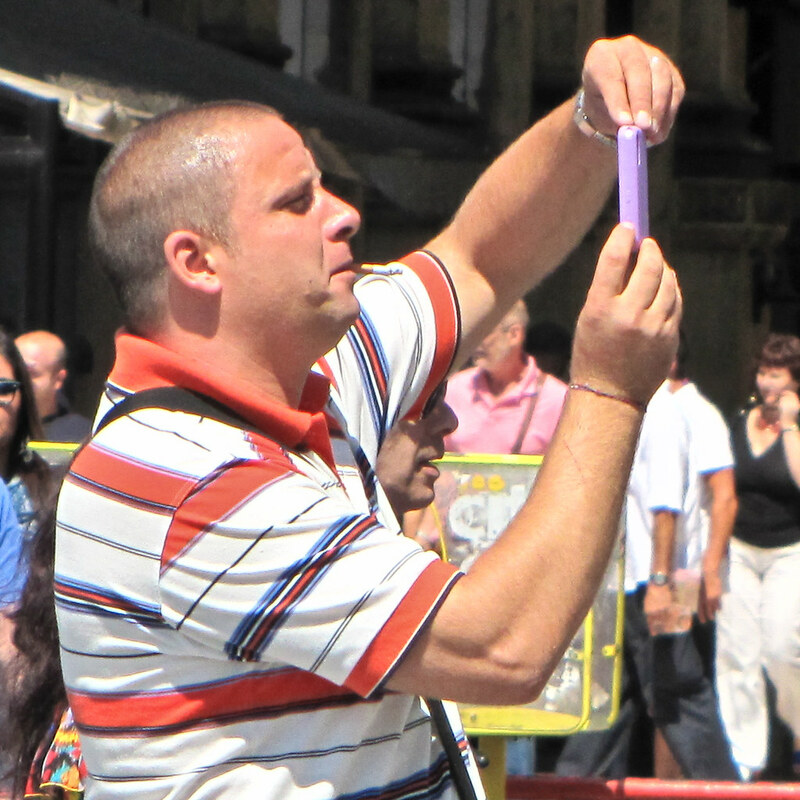 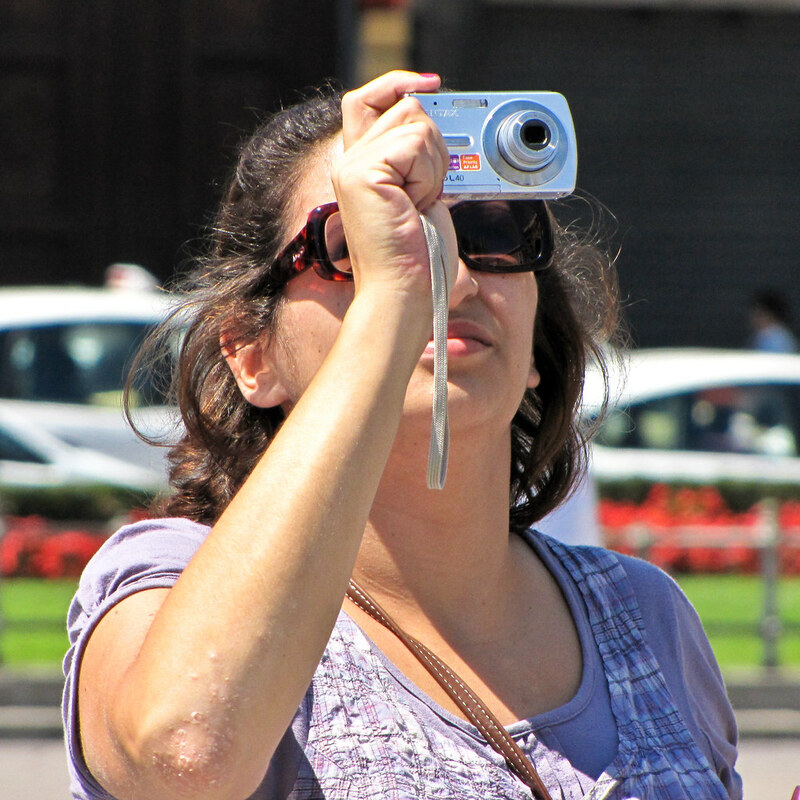 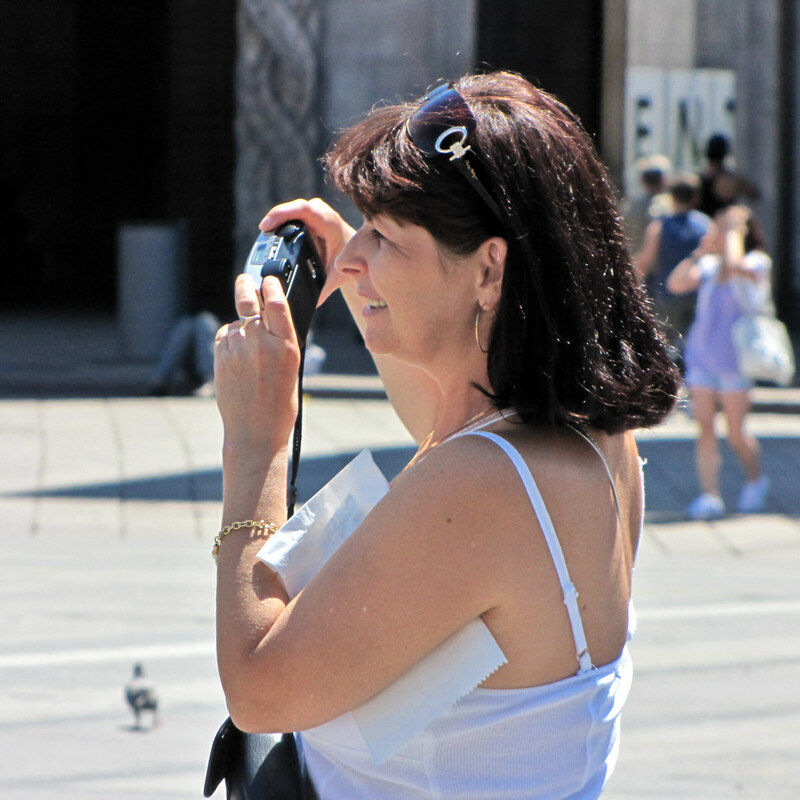 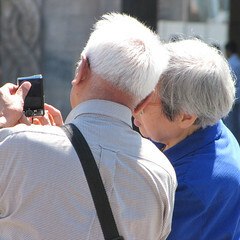 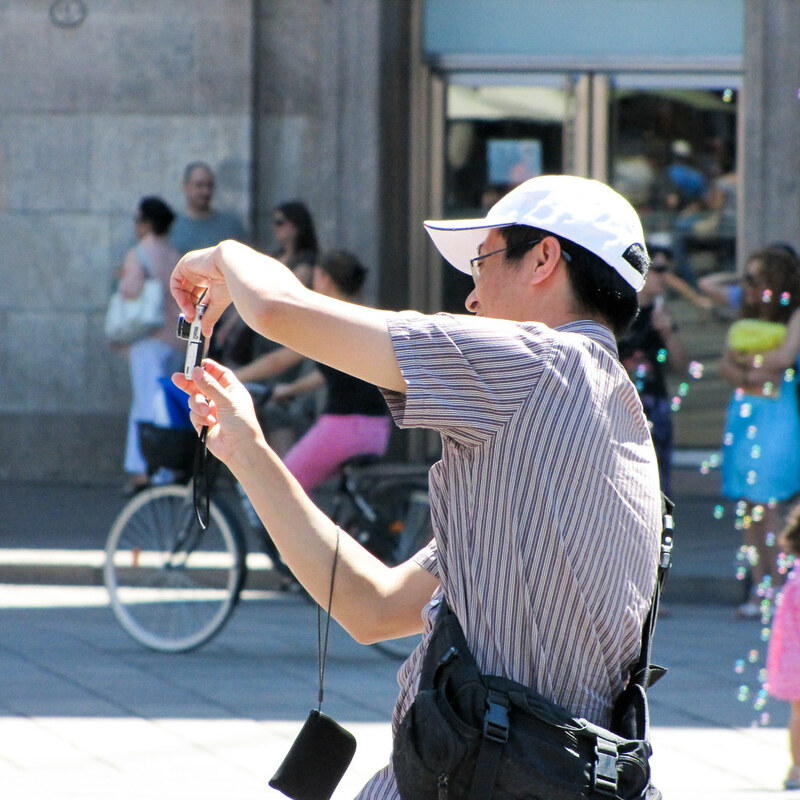 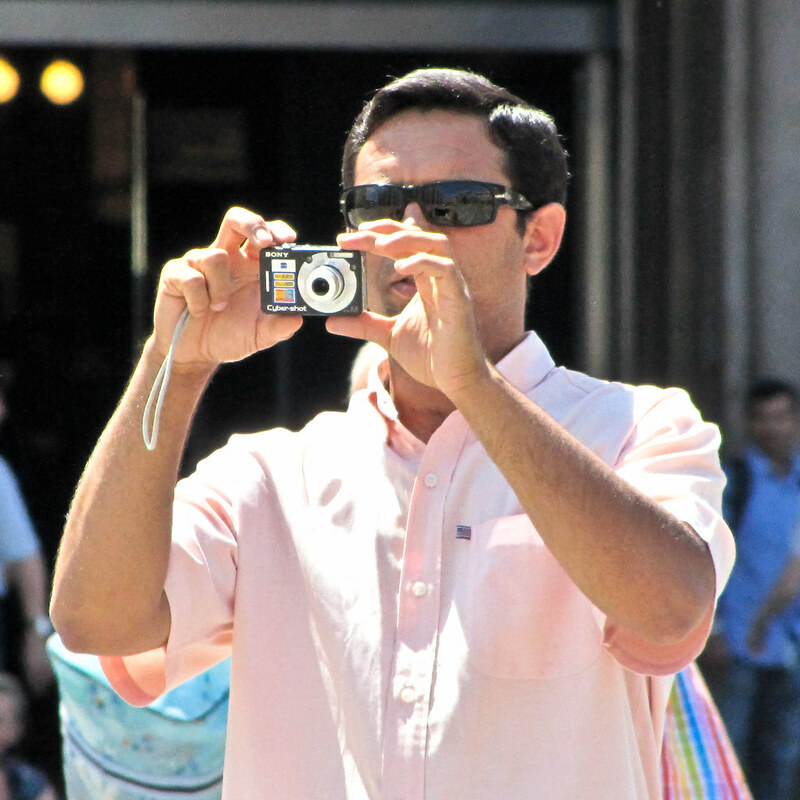 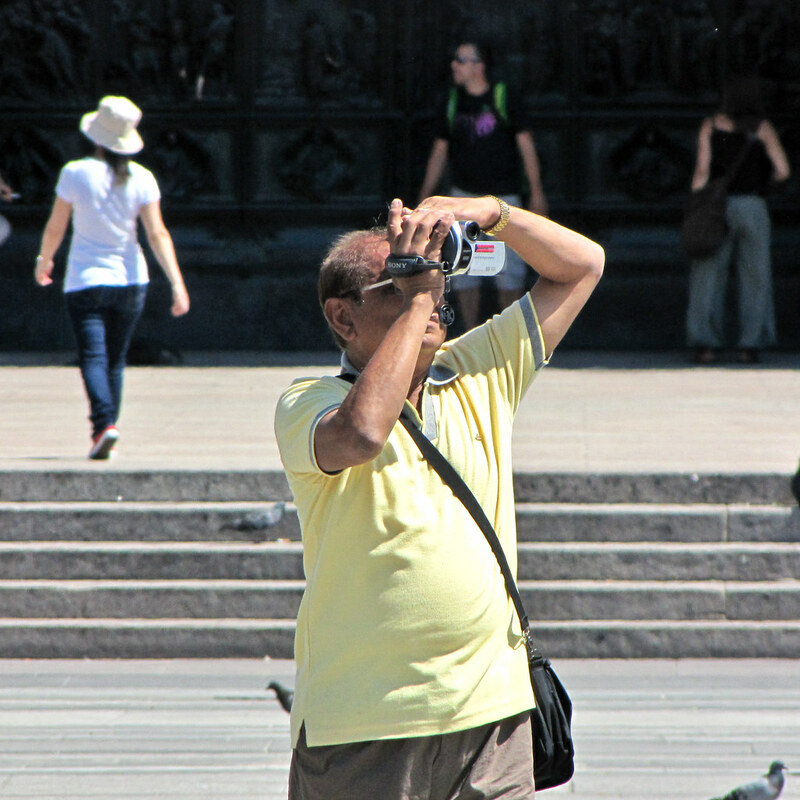 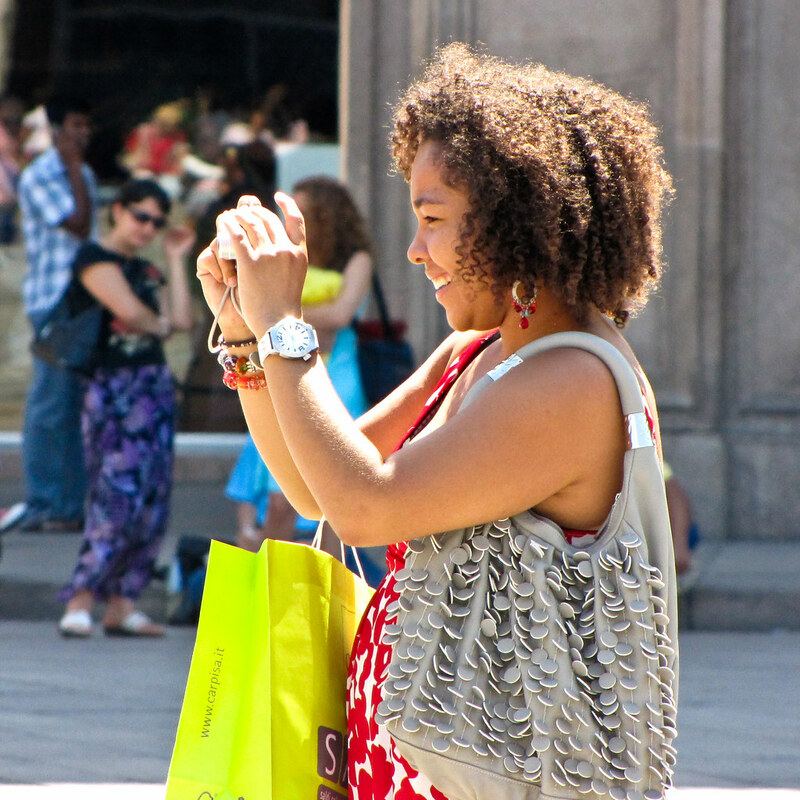 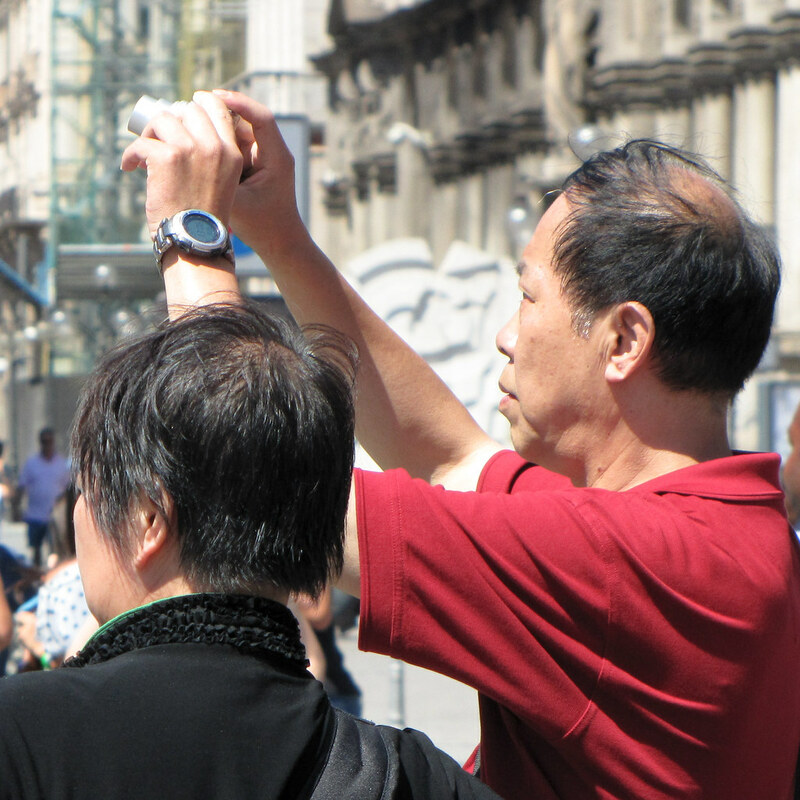 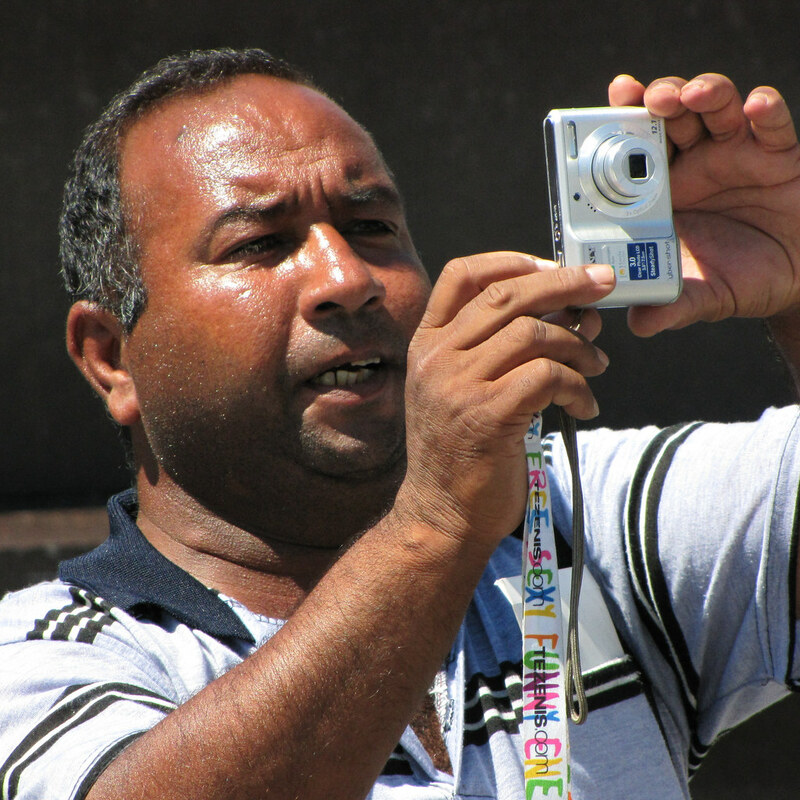 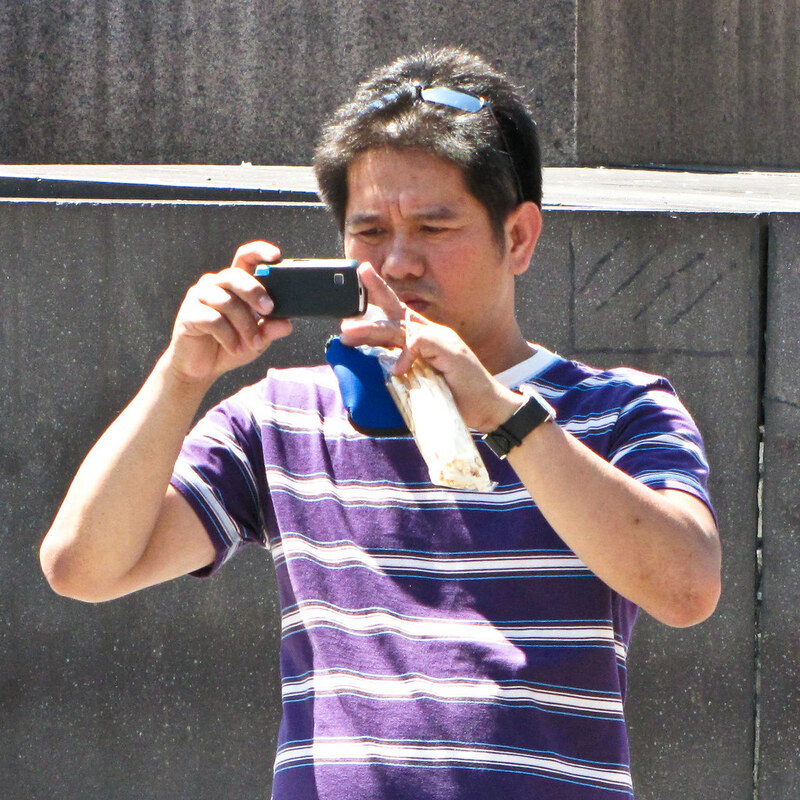 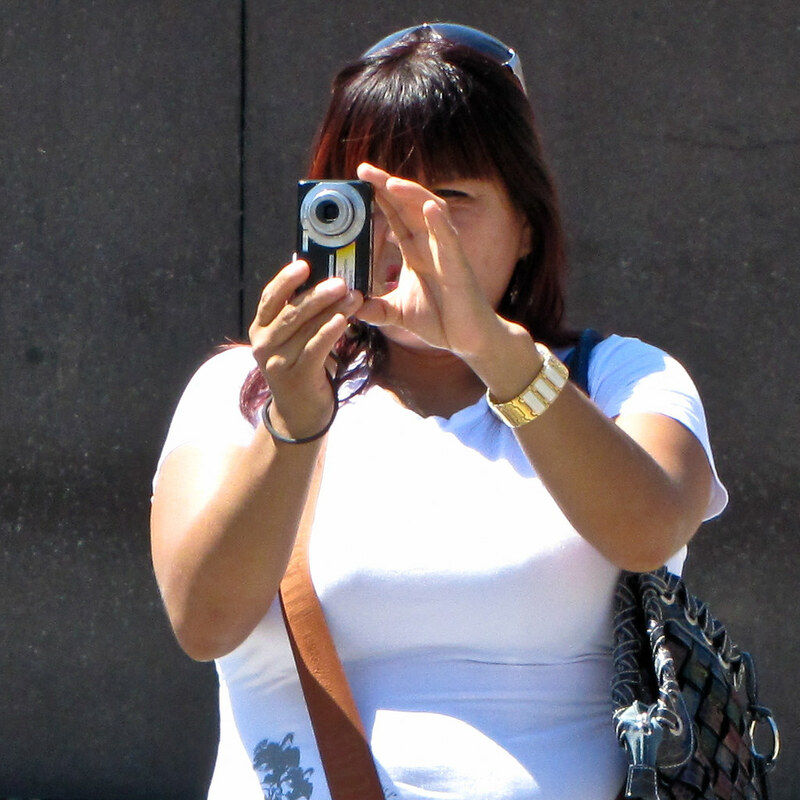 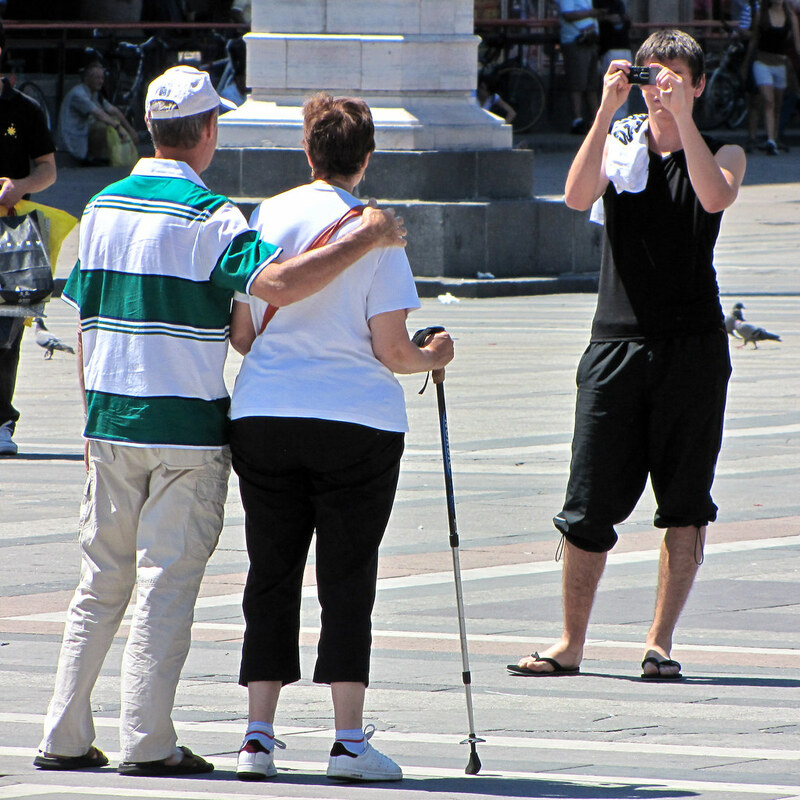 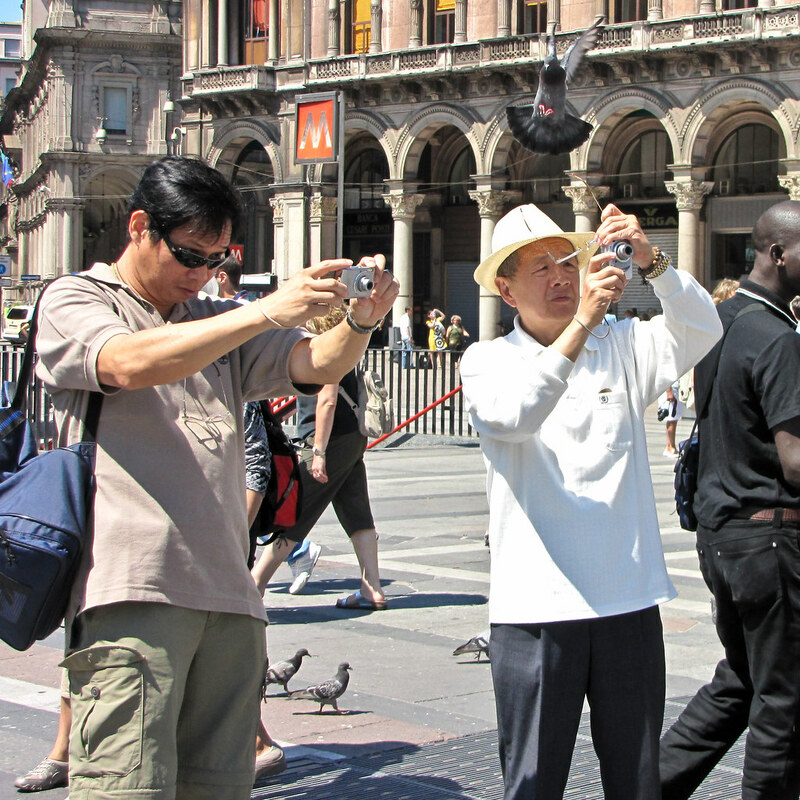 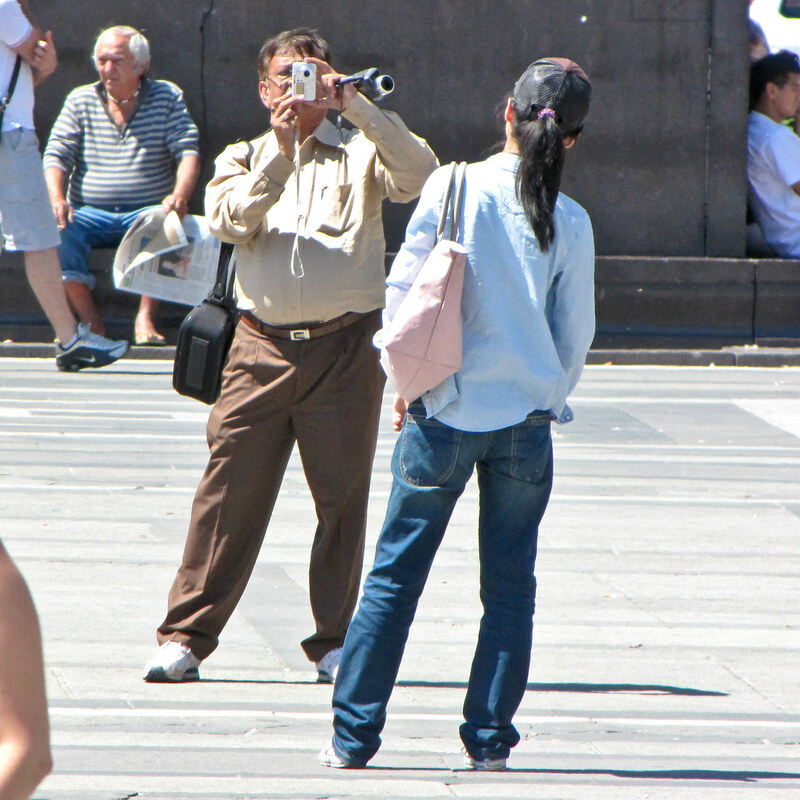 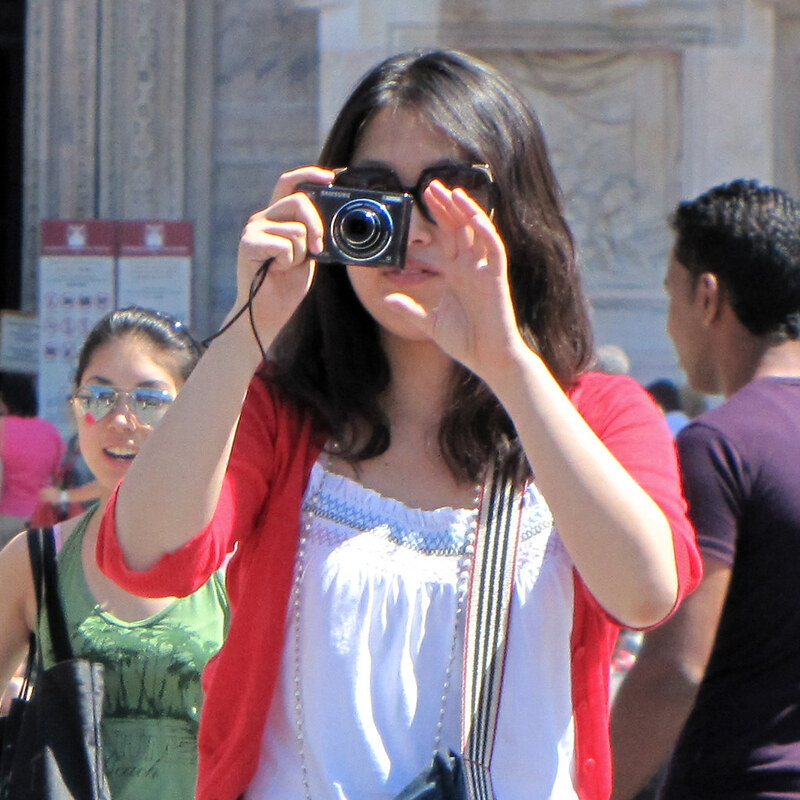 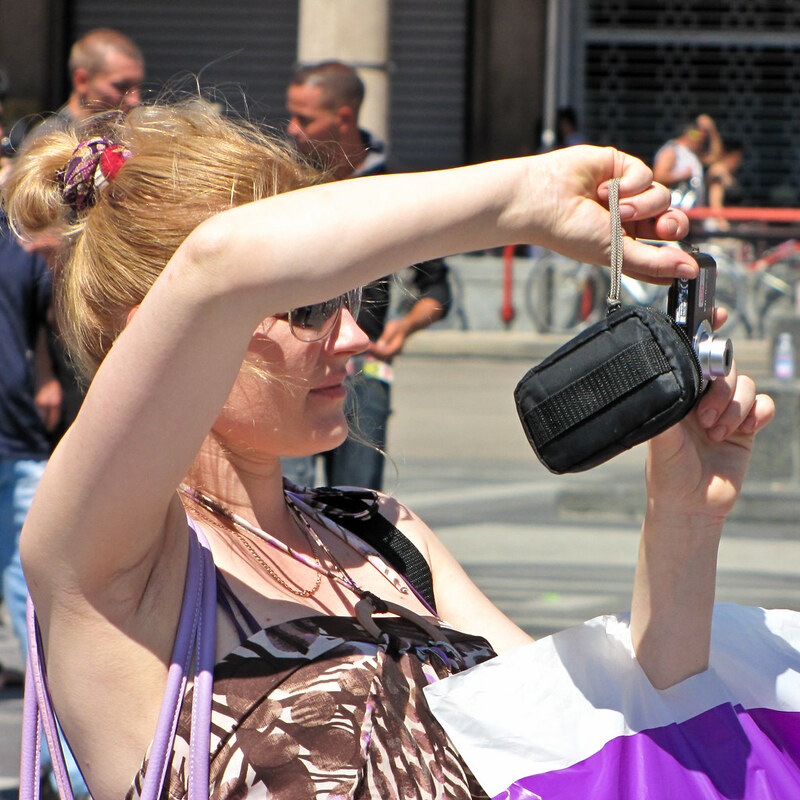 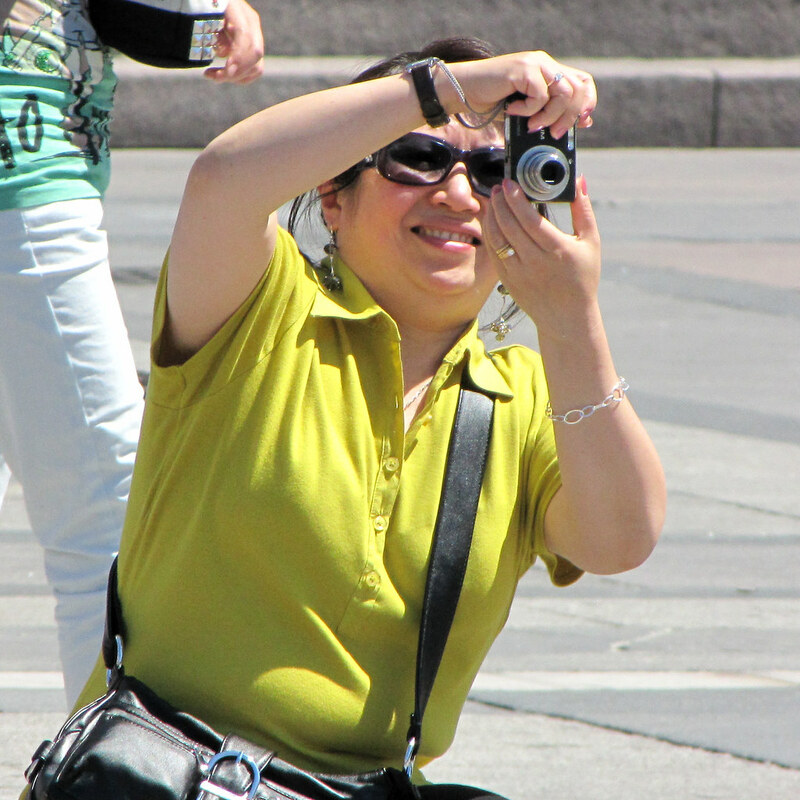 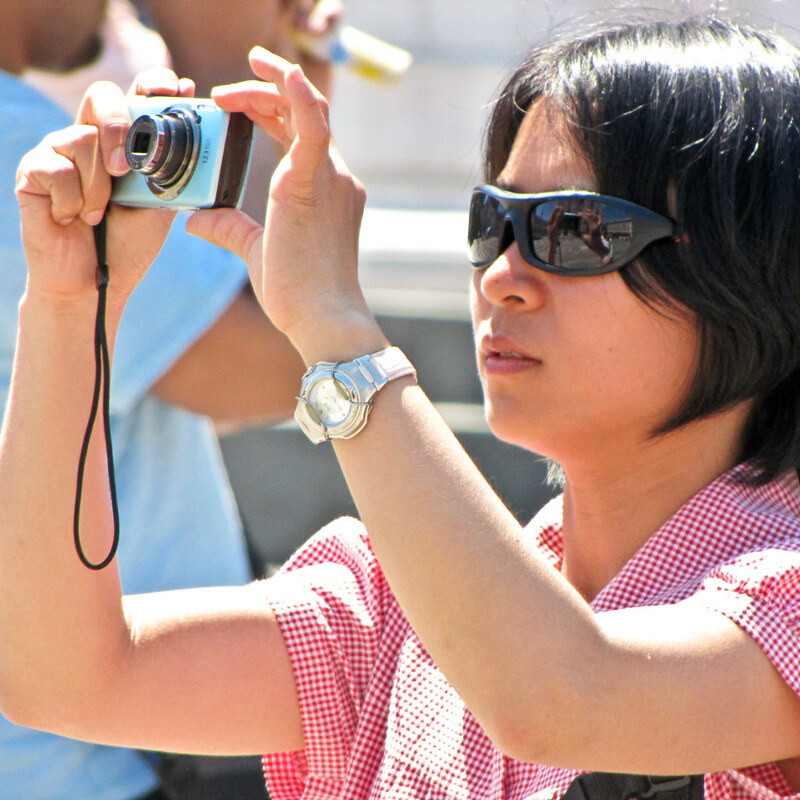 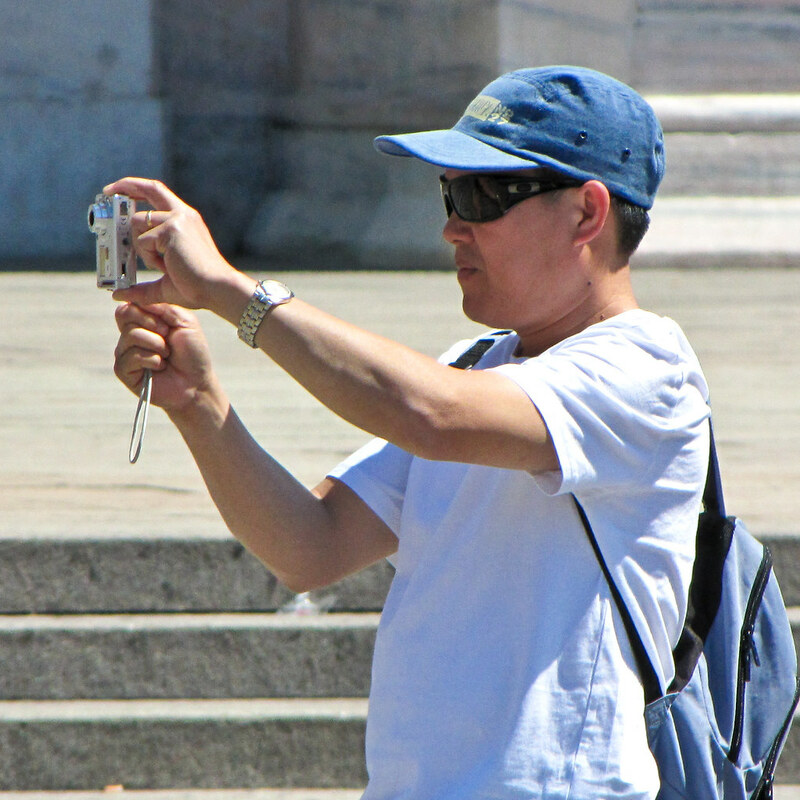 Of course, by far most tourists are only interested in snapshots, which reinforces the culture of these people happily snapping away at anything that strikes their fancy. 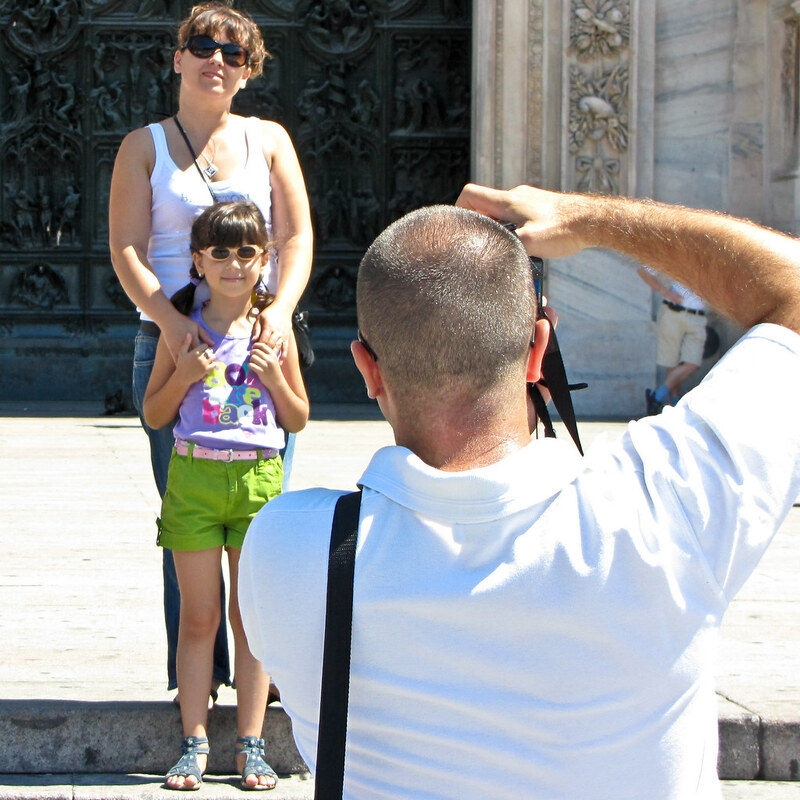 Not long ago, Eric Fischer created a gorgeous set of maps, comparing what tourists and locals take pictures of, in major touristic destinations all over the world, using Flickr and some magic as a base. 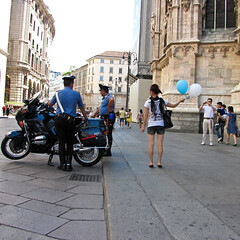 One of the maps is actually of Milan. What Fischer’s match don’t show is what direction photos are taken in. 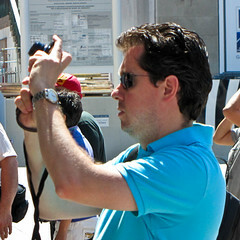 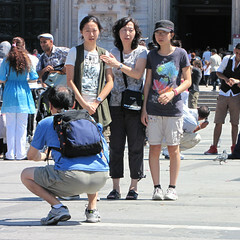 For the set of photos related to this post, I put the tourists themselves on the spot. 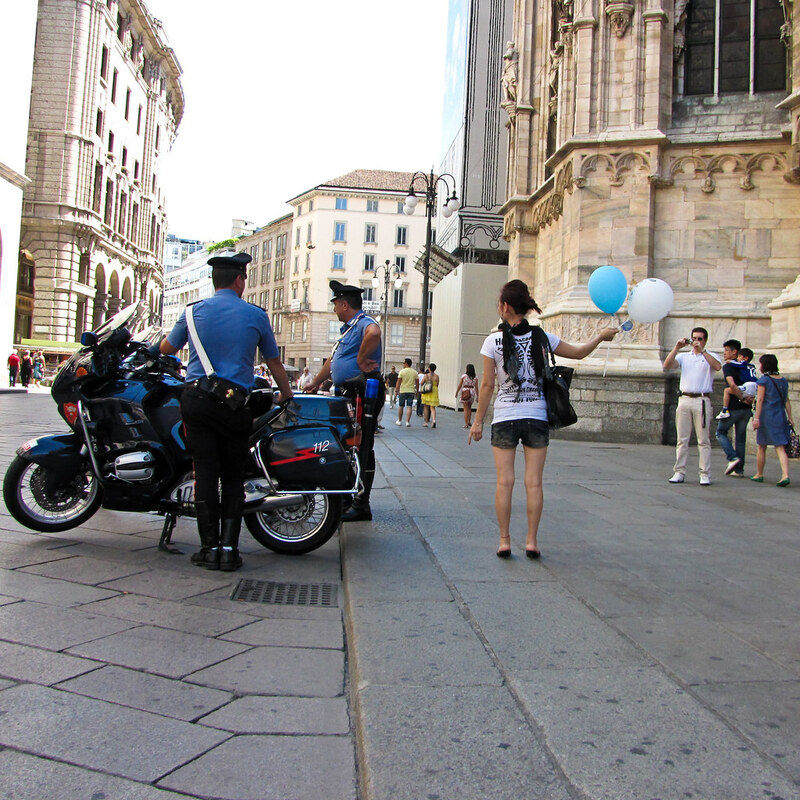 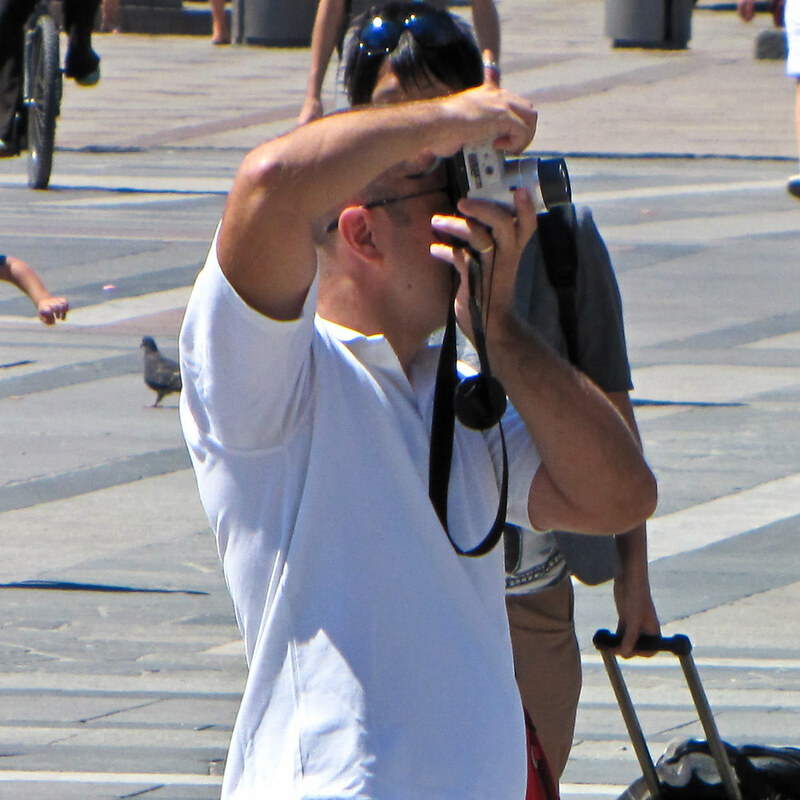 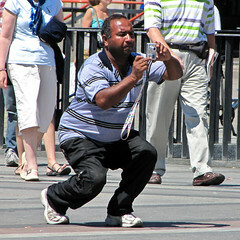 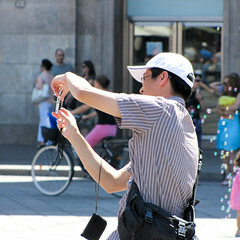 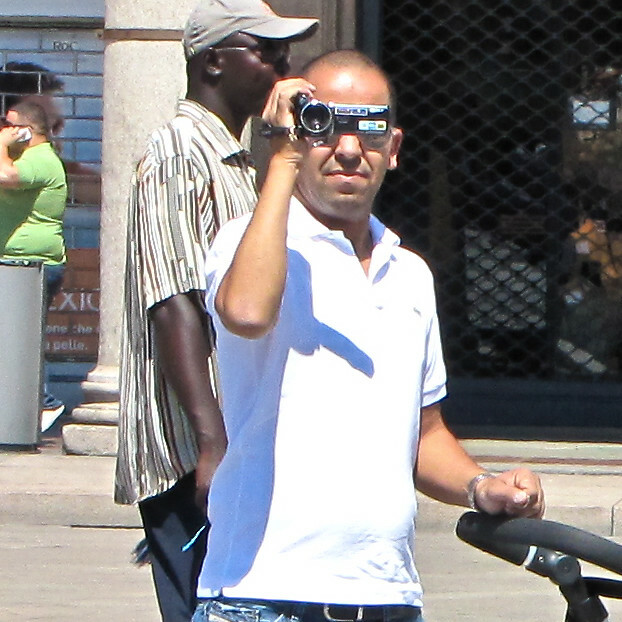 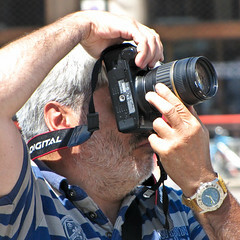 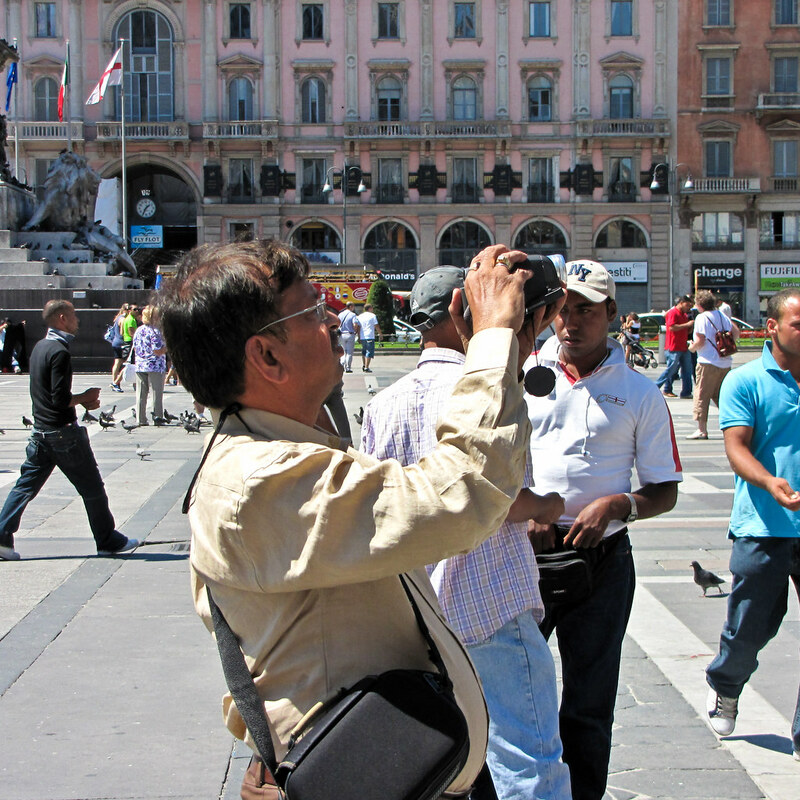 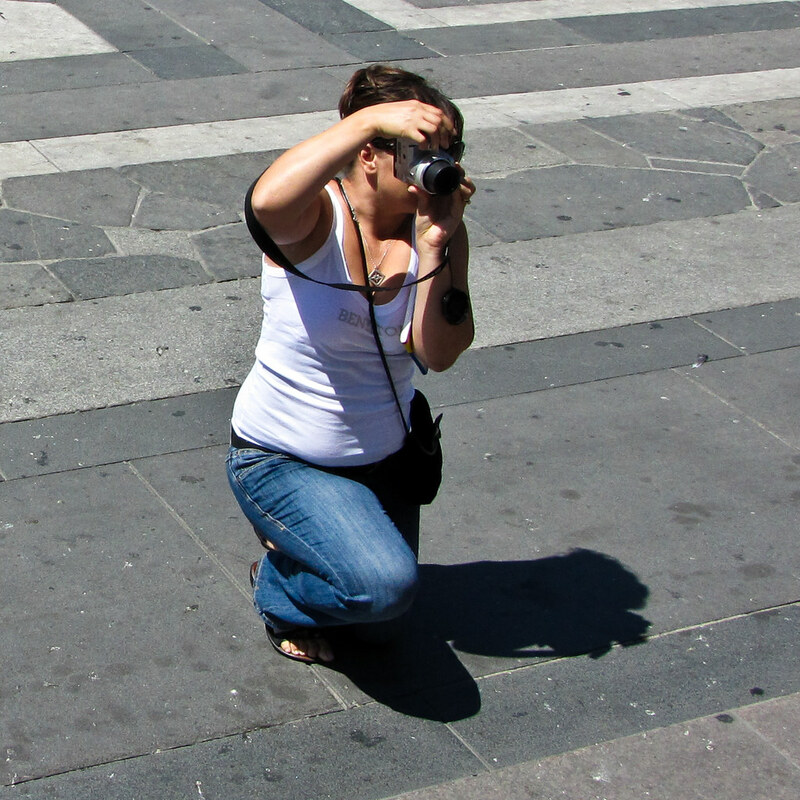 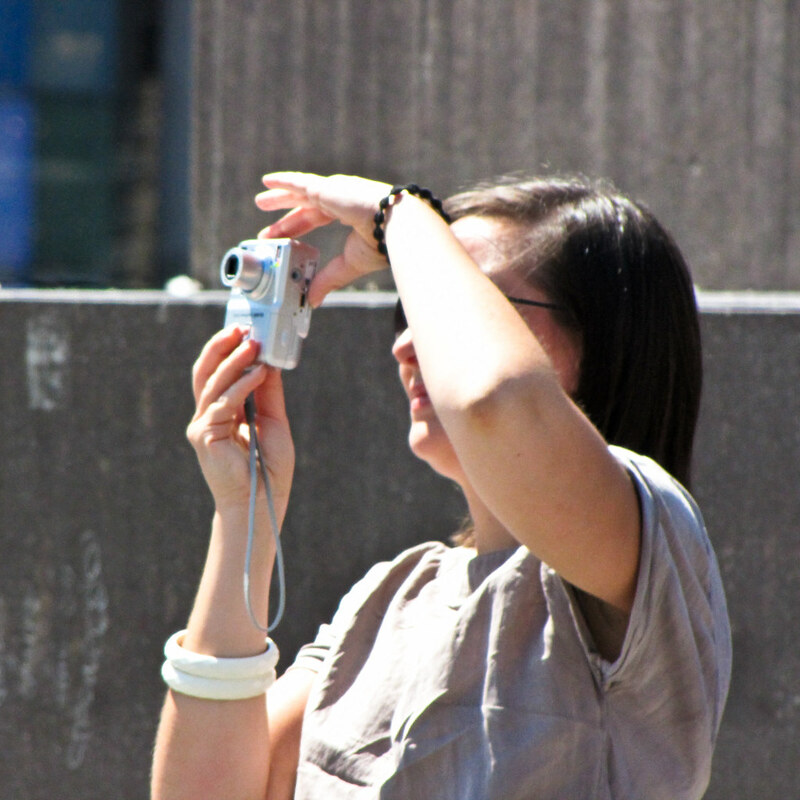 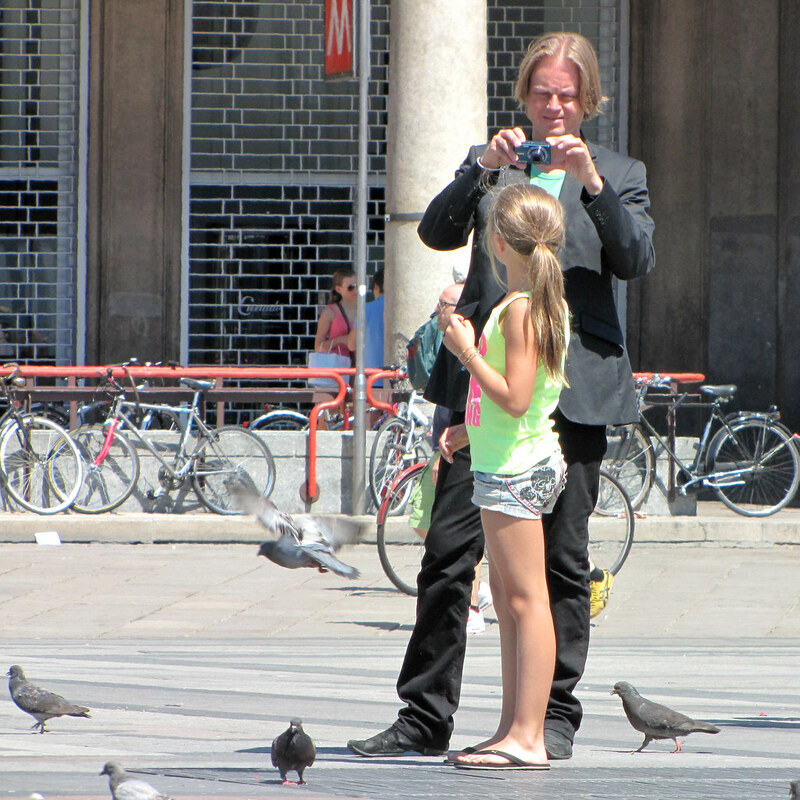 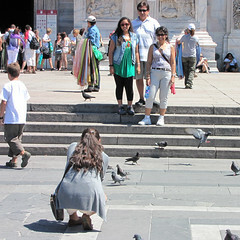 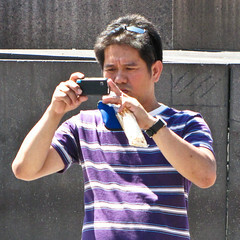 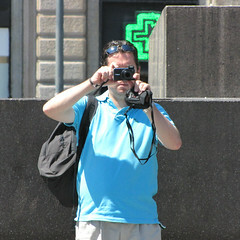 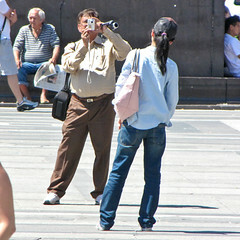 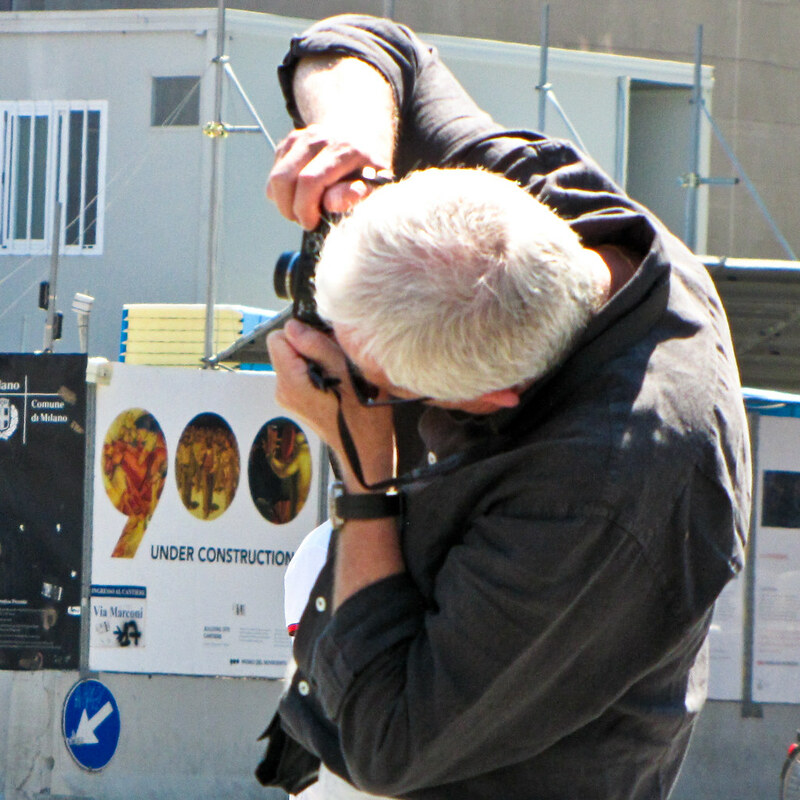 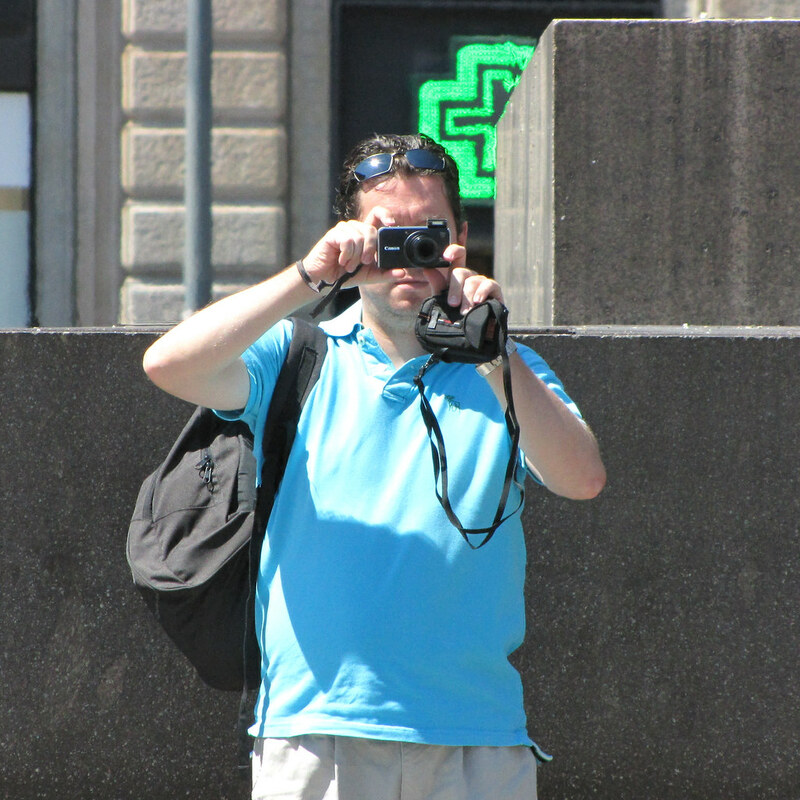 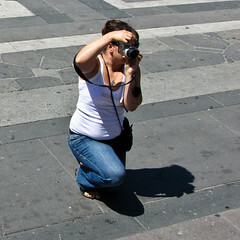 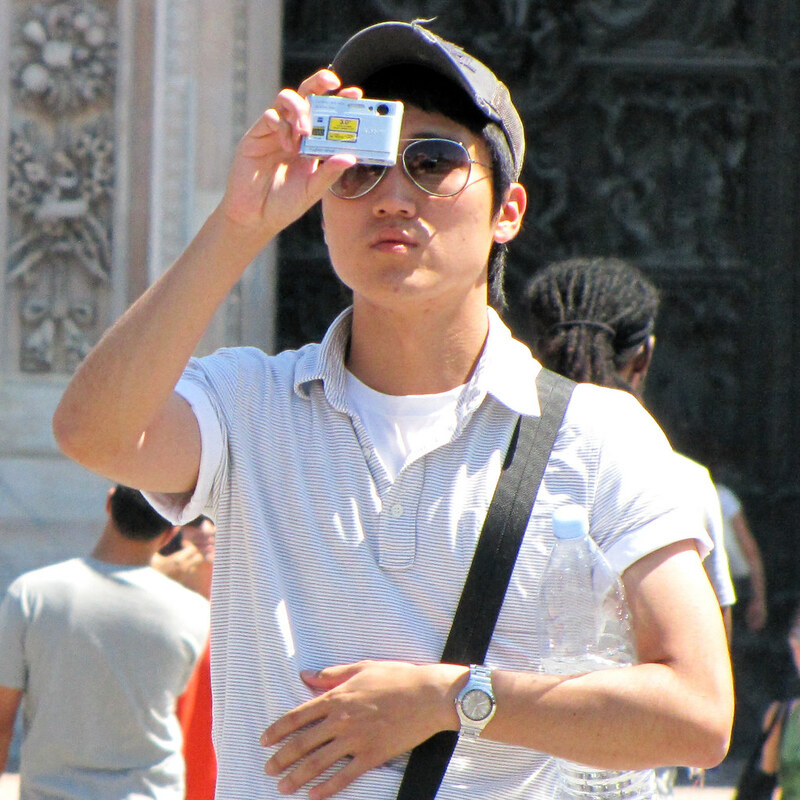 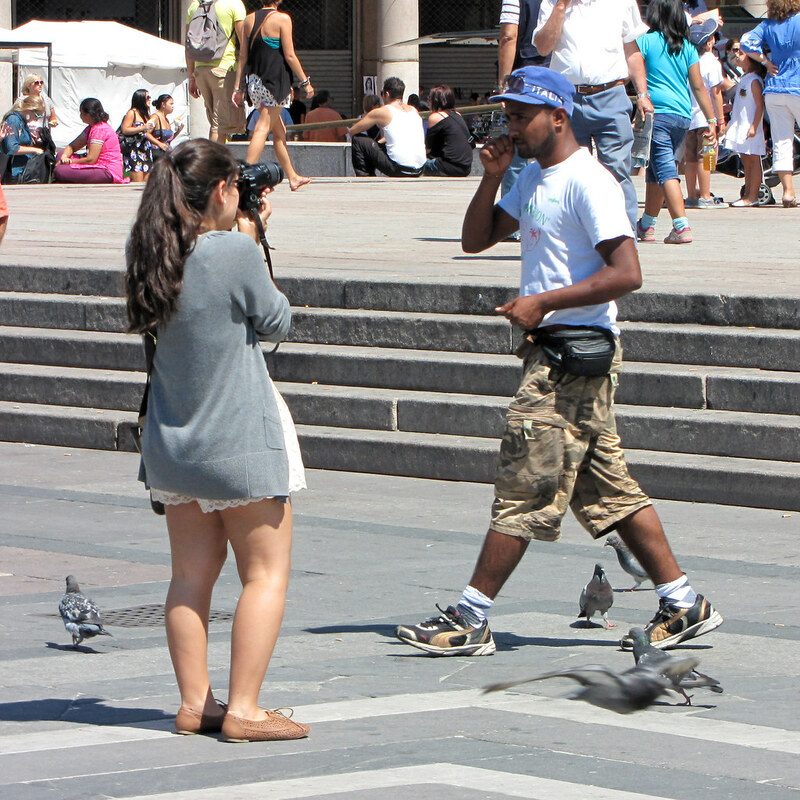 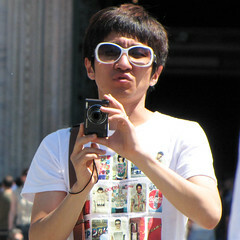 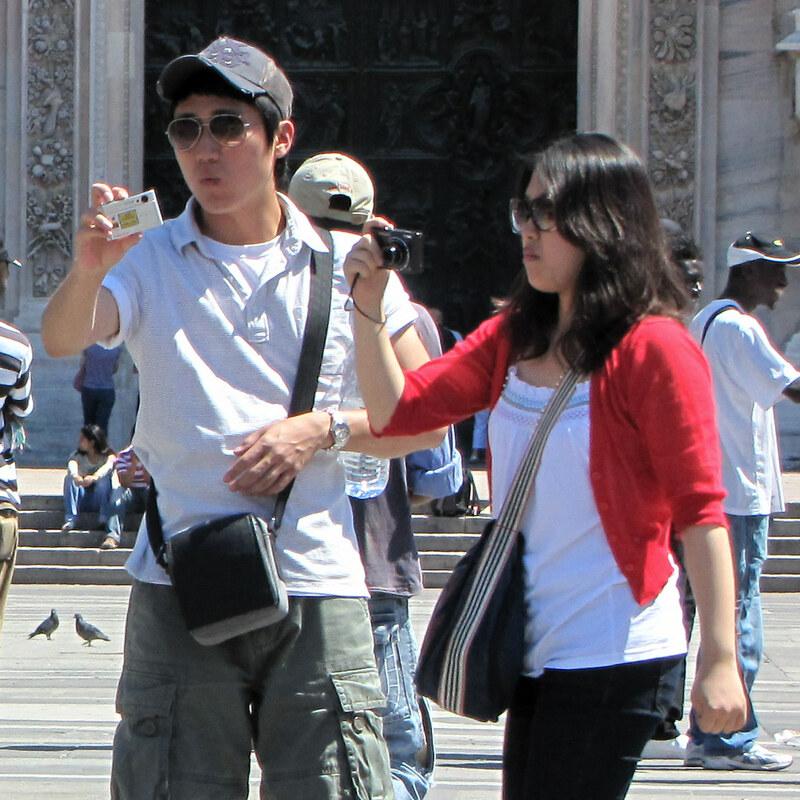 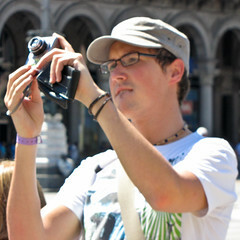 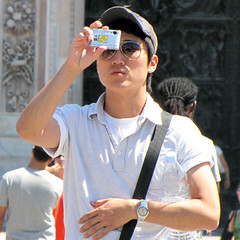 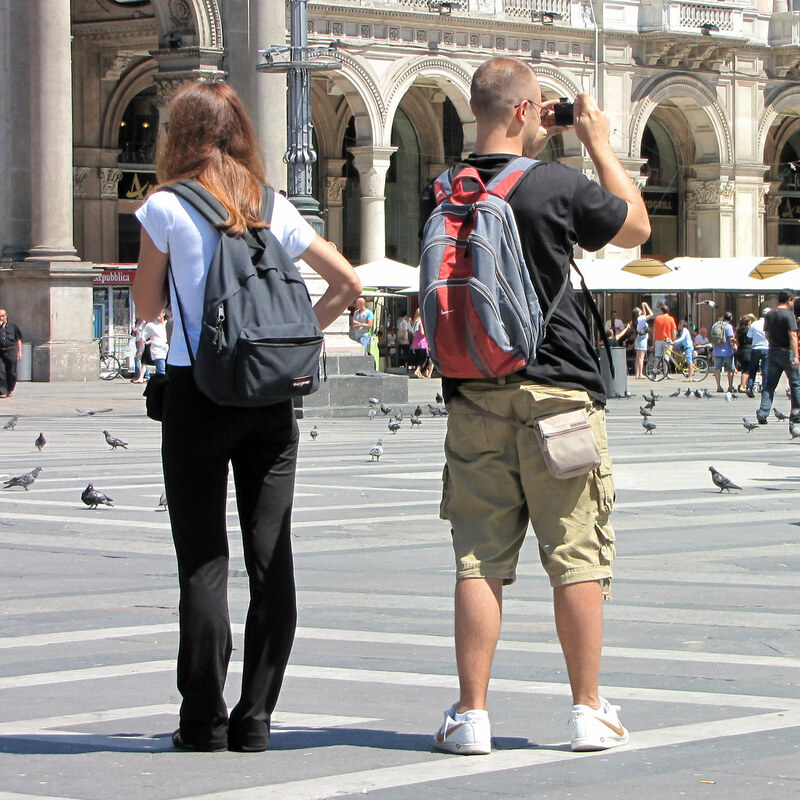 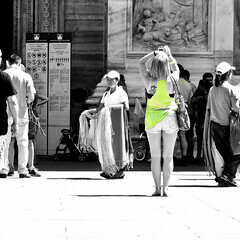 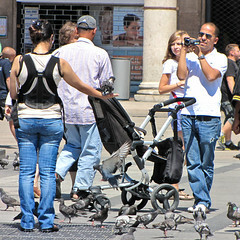 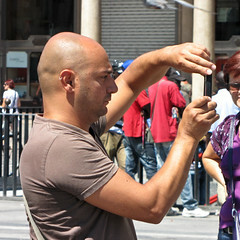 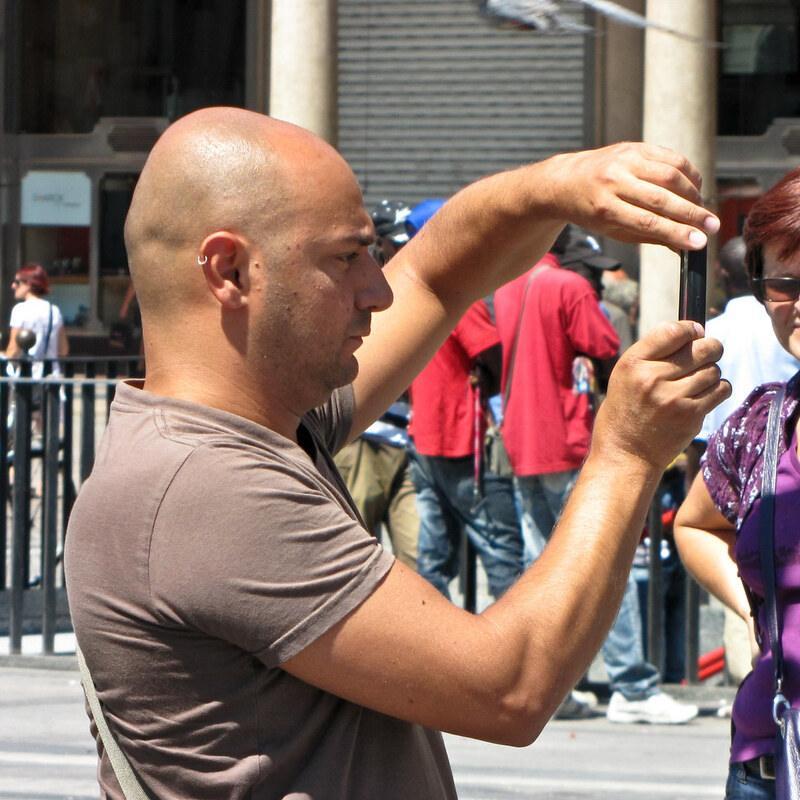 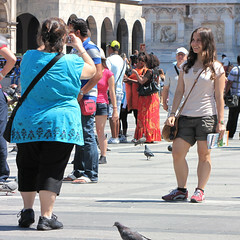 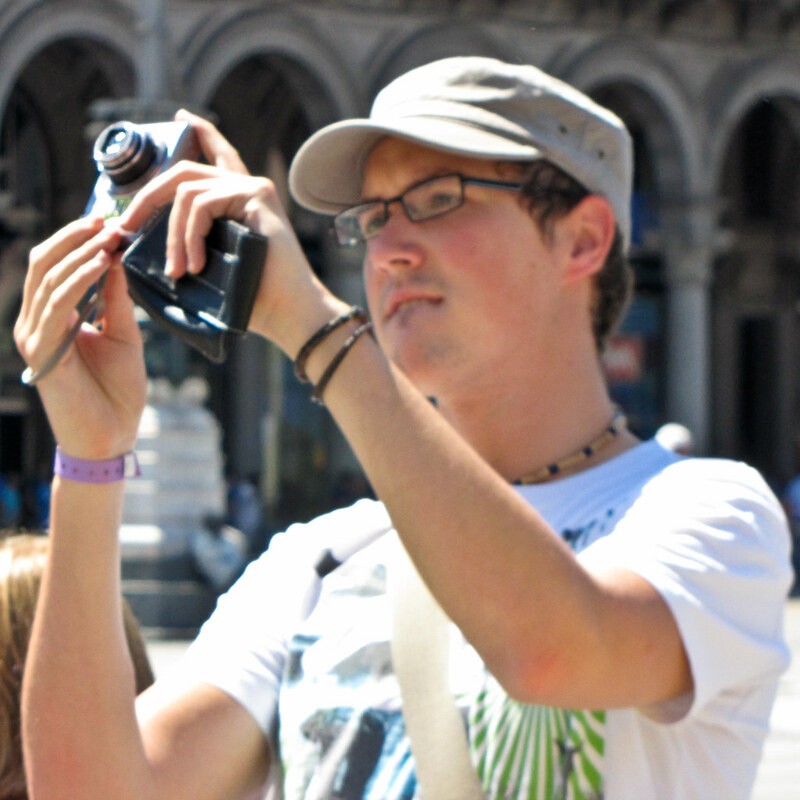 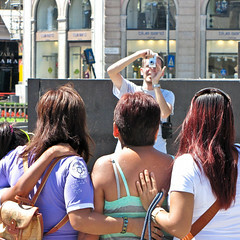 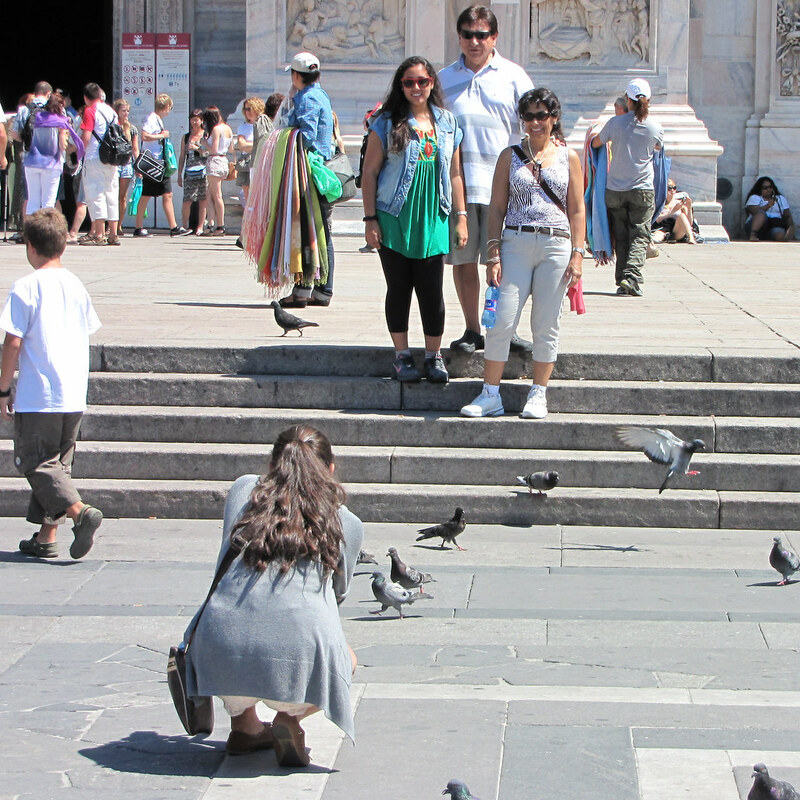 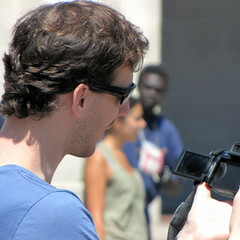 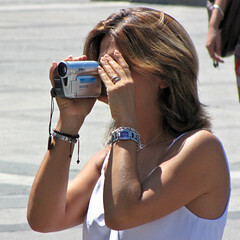 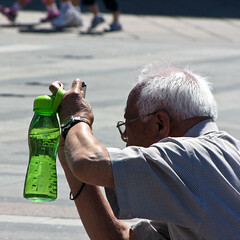 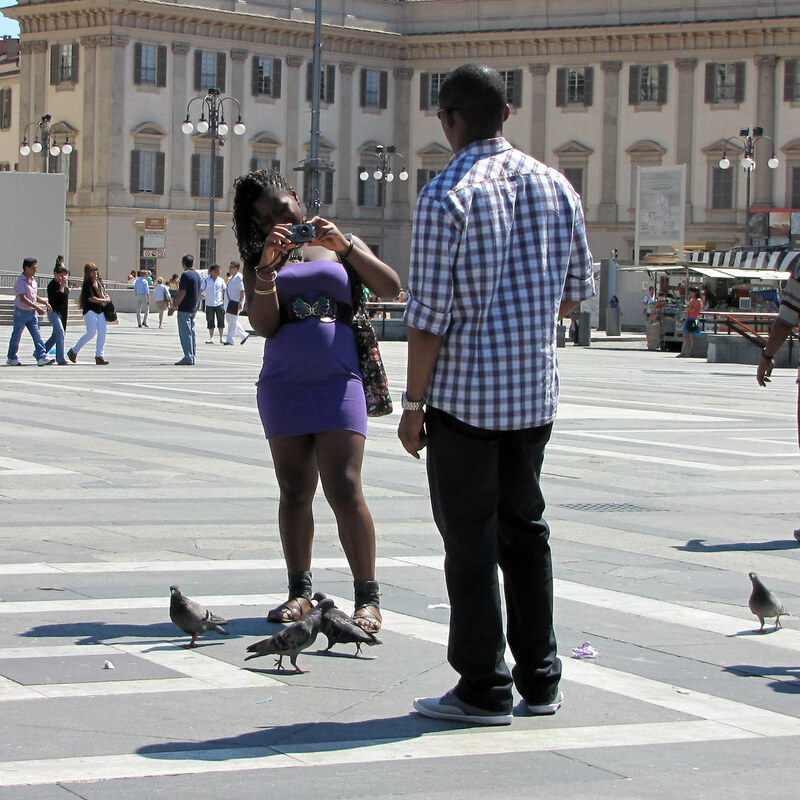 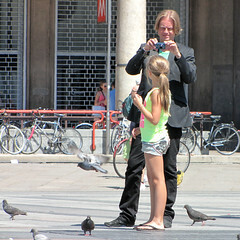 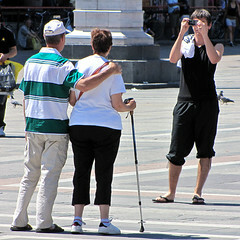 Shooting themselves, their friends or other tourists, upon request, next to Il Duomo, I photographed the photographers. 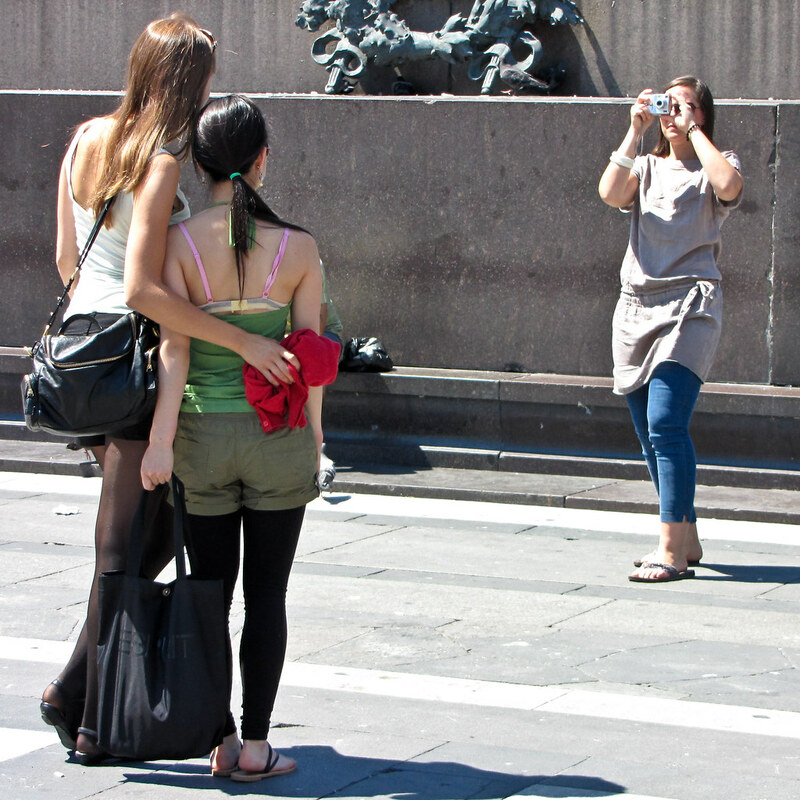 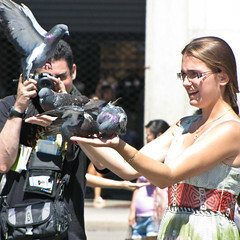 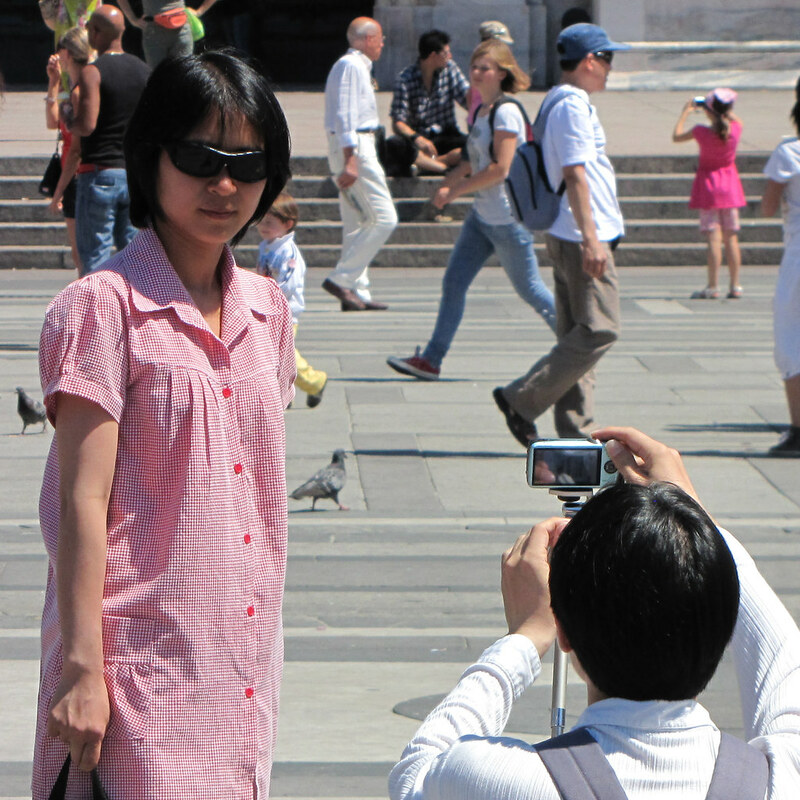 In the same location as these tourists, my camera was pointed in the exact opposite direction. 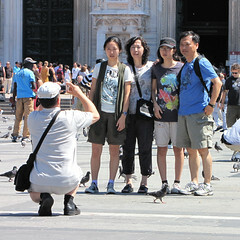 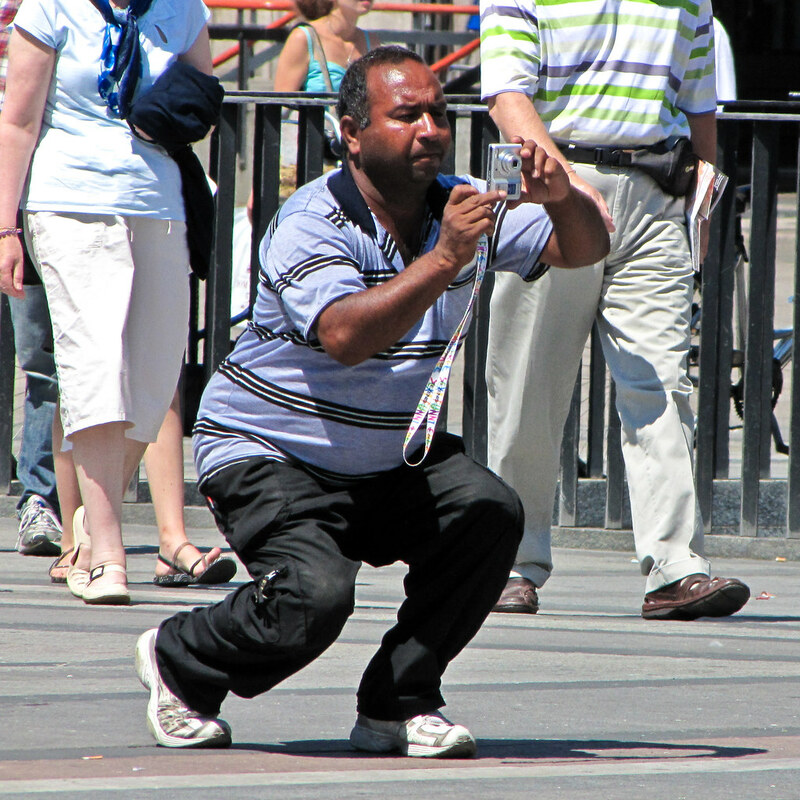 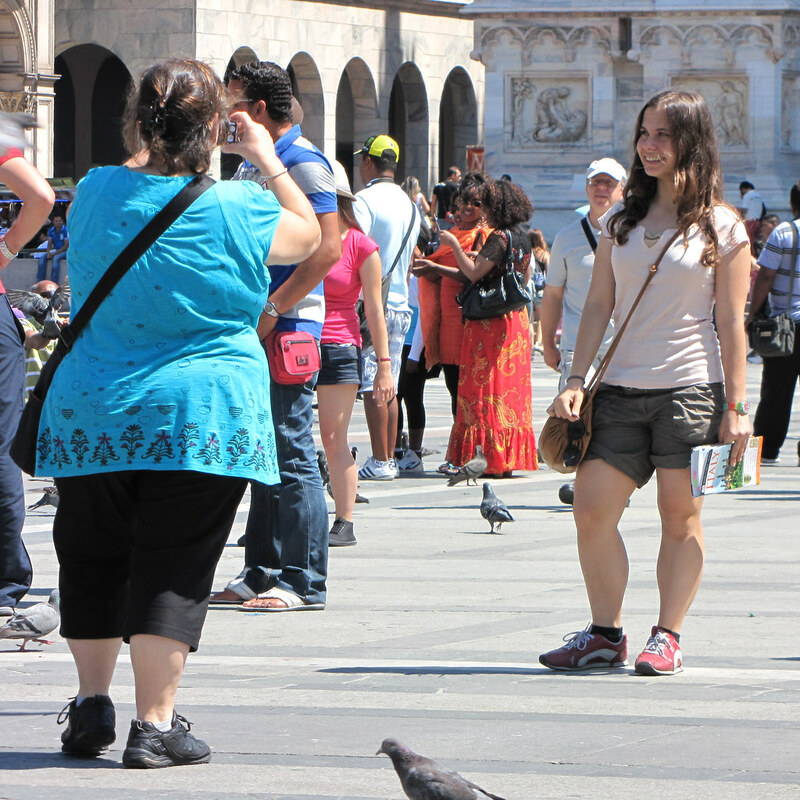 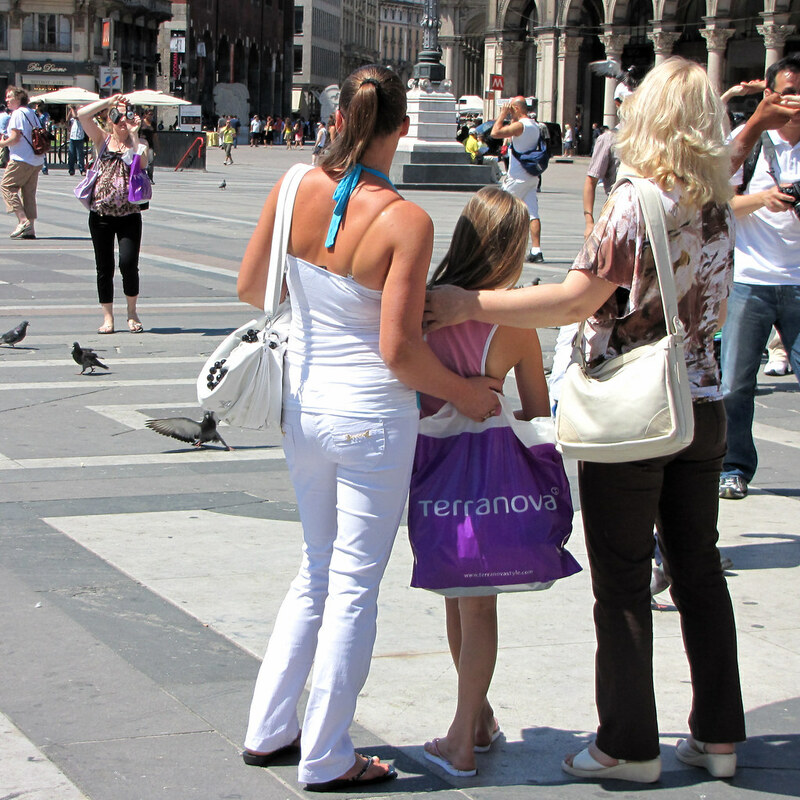 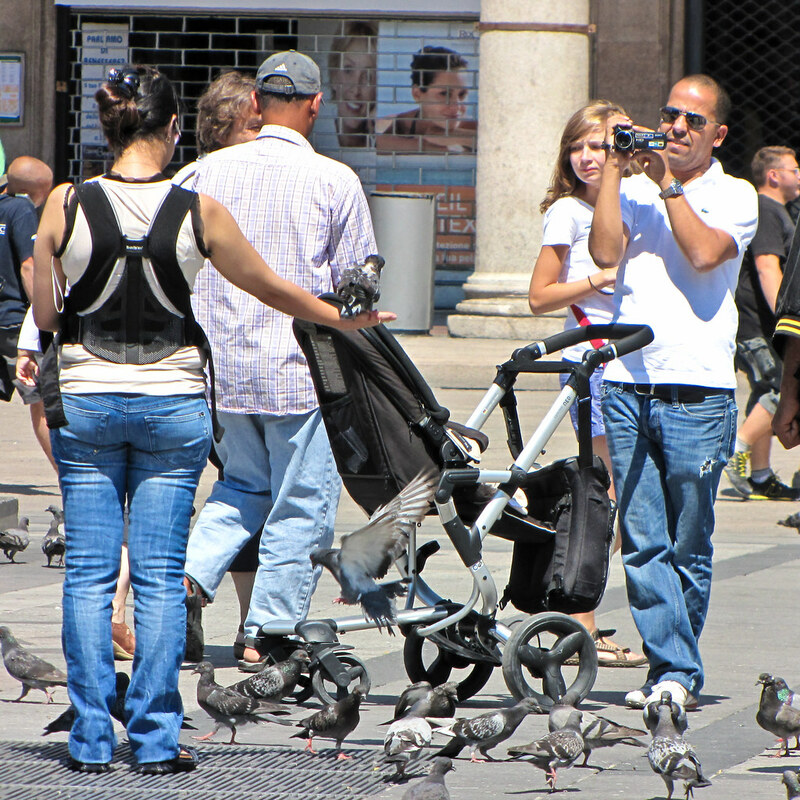 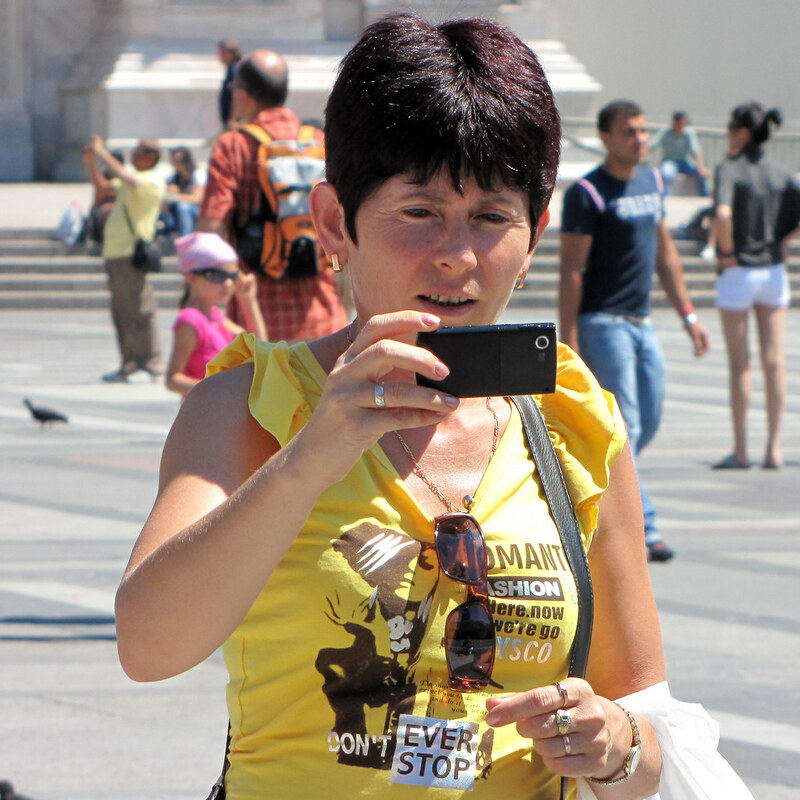 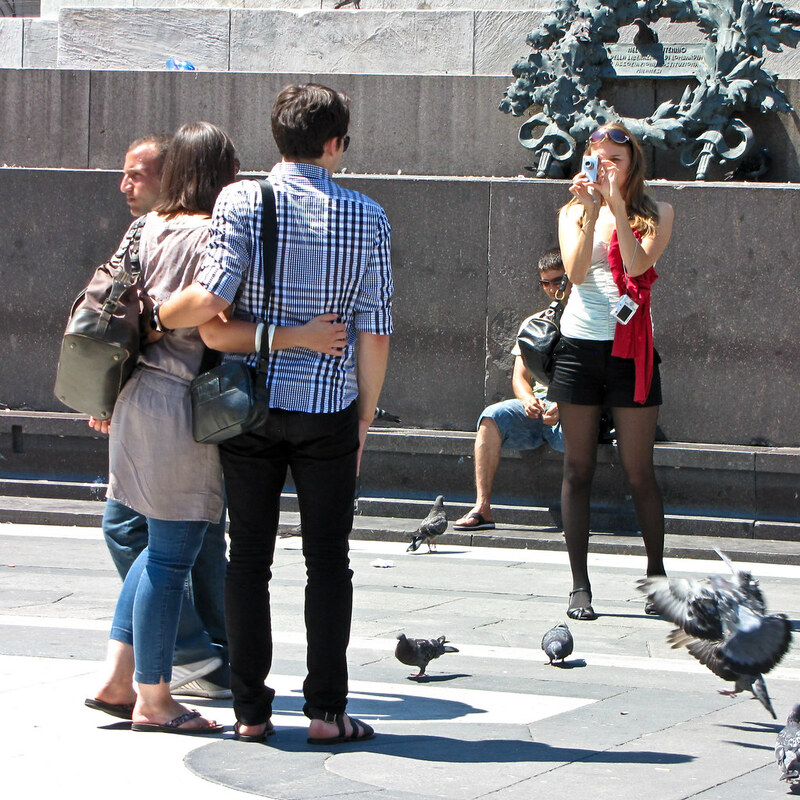 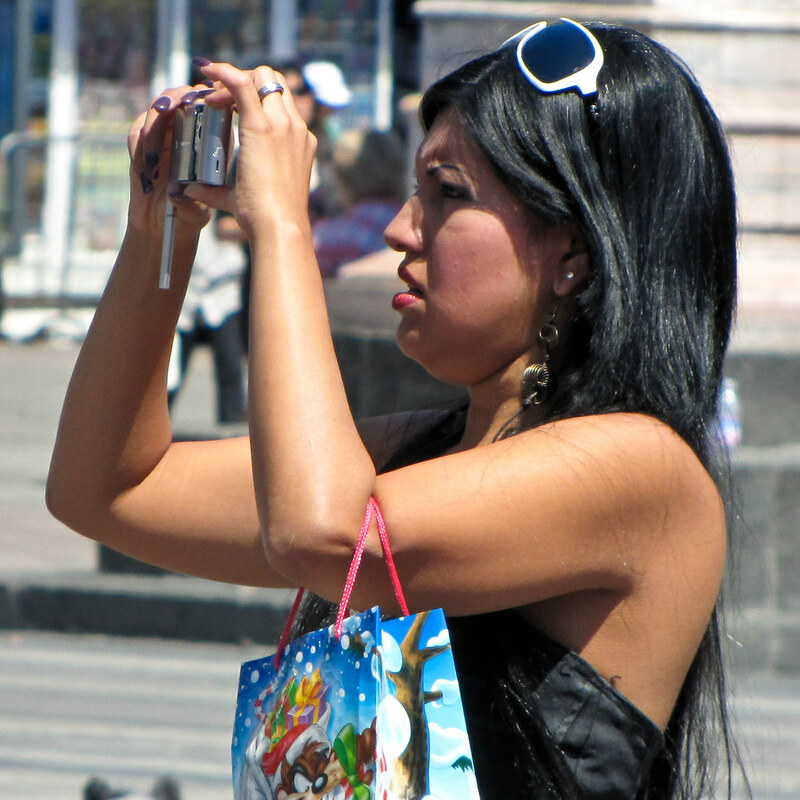 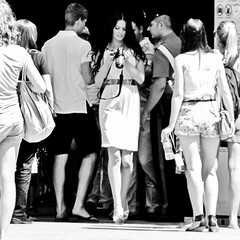 Not focusing on the tourist attraction, but making the tourists themselves the attraction. For Fischer’s maps, my photos are an anomaly, taken in the same location as the regular tourist snapshots, but of completely different subjects, while being taken by, what Fischer defines as a tourist, that is, someone who hasn’t been taken pictures in the city being mapped for over a month. Meanwhile, realising the sheer number of photos shot on an average day of tourists at Il Duomo makes shooting any additional photo an act of folly. 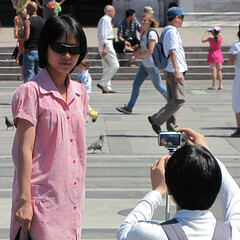 All these photos are so similar, creating one more becomes almost pointless. 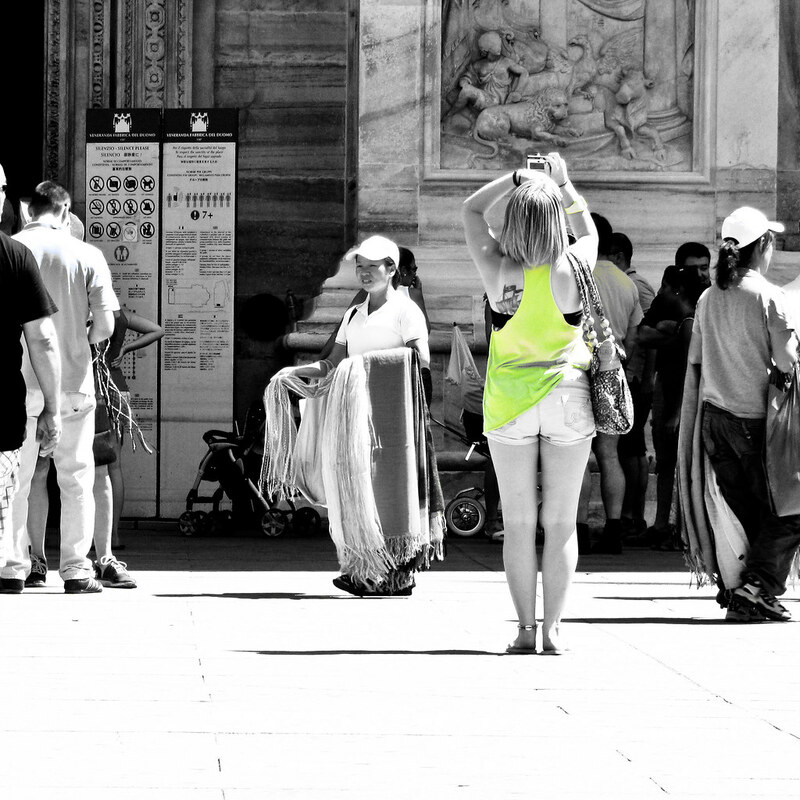 Yet it isn’t, as everyone wants to be able to show they’ve seen the church and its facade, remembering it not being enough.